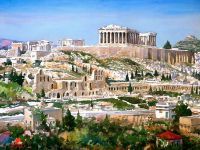 The Parthenon, built on the Acropolis rock in 450 b.c., is on a spectacular sight that is visible from almost any location in Athens. 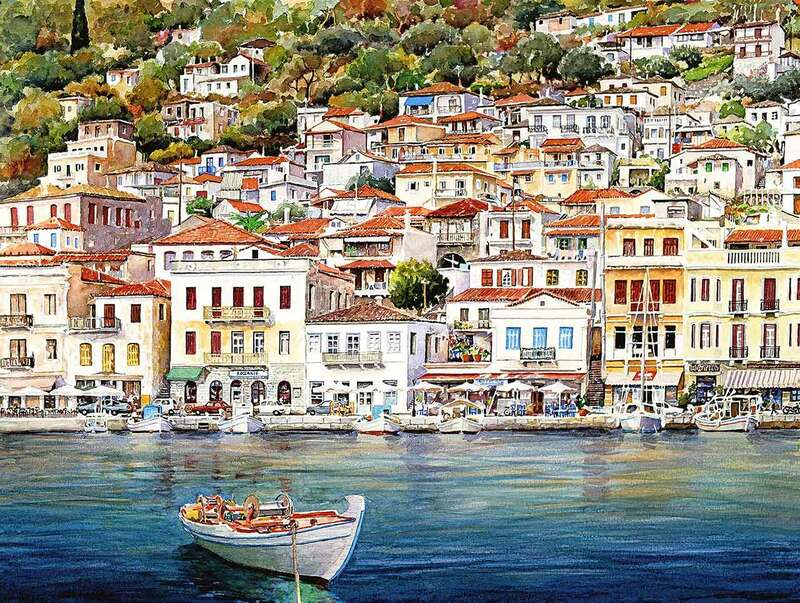 Dedicated to the Goddess Athena, (the virgin) it has survived many wars and a 400 year Turkish occupation. 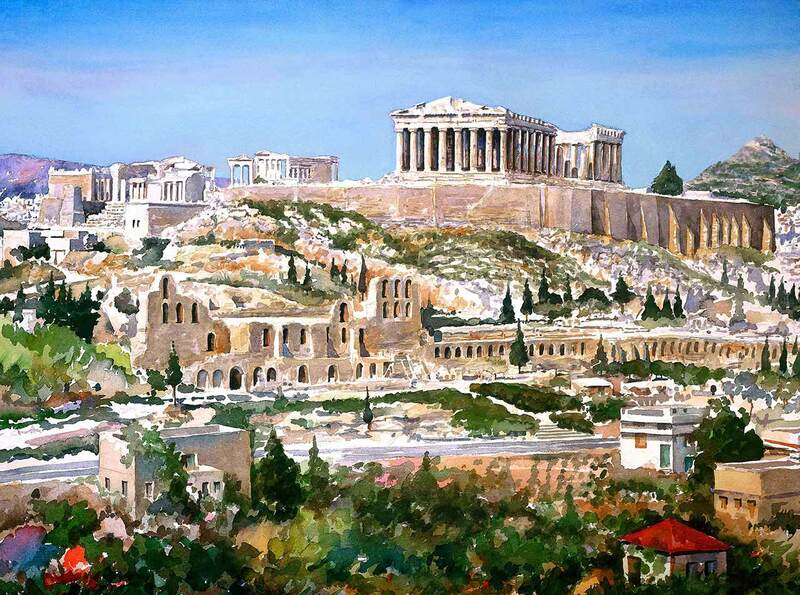 The Parthenon is now being restored and protected from further deterioration and is still enjoyed by thousands of visitors each year. 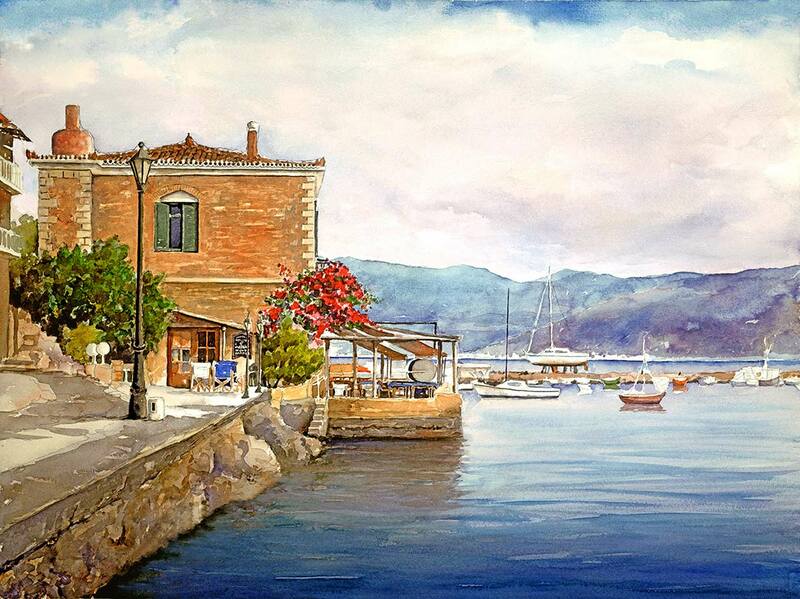 This picturesque harbor is on the Island of Aegina. 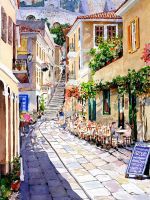 It is one of the closest Islands to Athens and is a popular destination for tourists and Athenians alike. 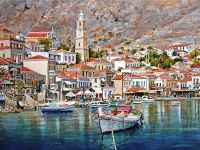 Relaxing at the harbor zacharoplasteon (dessert shop) is a favorite pastime.The prominent harbor church is named Panayitsa or Mother Mary. The church of Holy Wisdom or Aghia Sofia is a masterpiece of Byzantine architecture that has had a widespread and enduring influence on religious buildings worldwide. 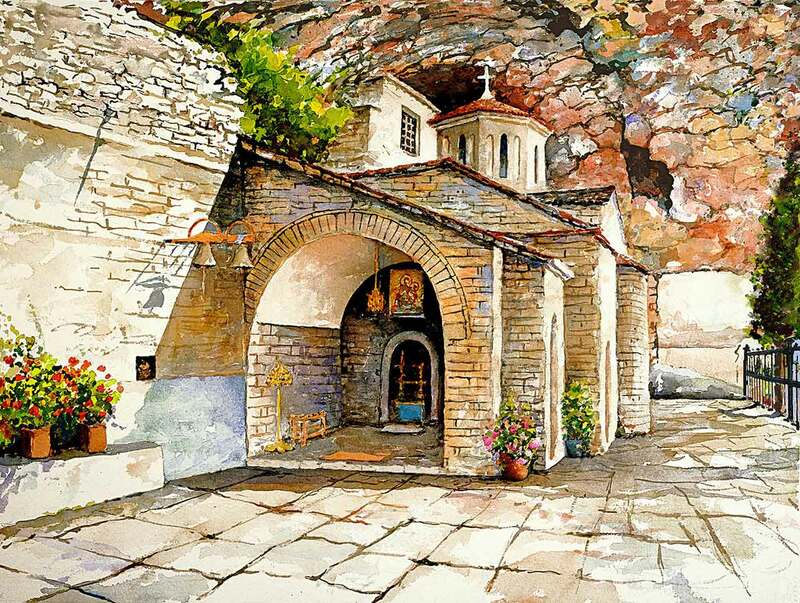 The first church built on the site was erected by Constantine about 300 a.d.. 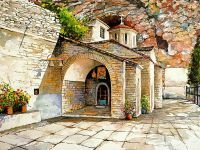 The present church was built by Justinian the Great around 535 a.d. 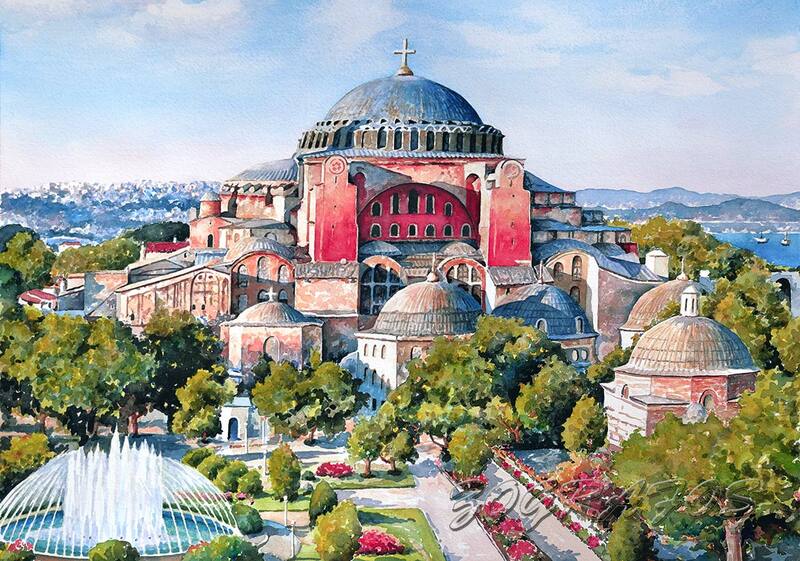 This location was the seat of the Orthodox Patriarch for 900 years until the fall of Constantinople in 1453. It was used as a stable and later a mosque until 1934 when kemal Attaturk; father of modern day Turkey, converted it into a museum. In recent years more effort has been made to maintain the structure and even uncover the icons that were earlier plastered over. It is now a premier tourist attraction in Istanbul. 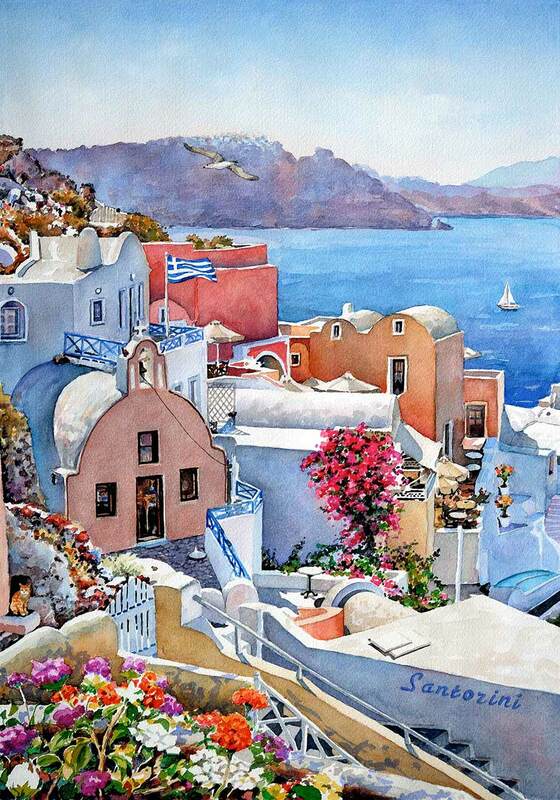 Greece has many Islands and endless miles of coastline. 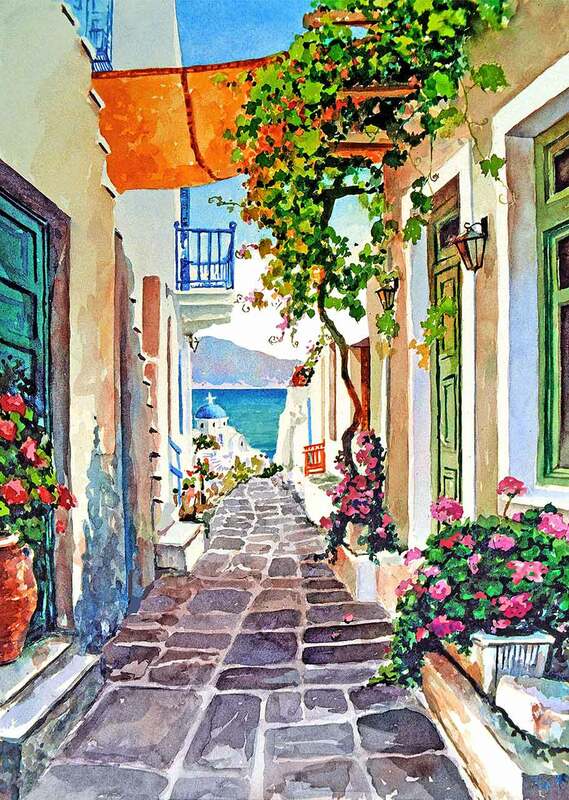 Small picturesque passageways that wind down from the Island’s center to the beach are common. 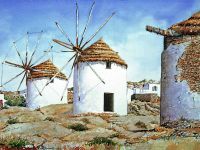 This one is in Paros, part of the Cyclades group.The Island has fertile plains so it has a good balance of tourism and agriculture. 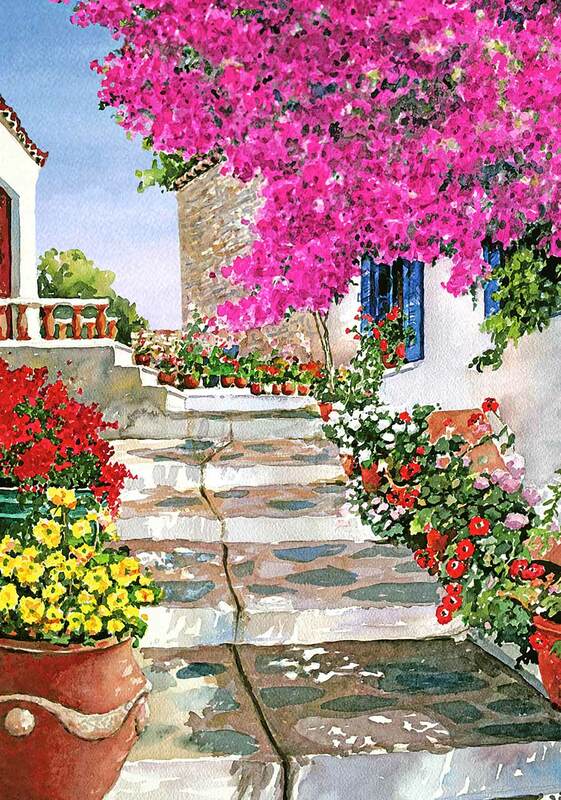 Large yards are uncommon in the village and homeowners make the most of the stoop to display colorful pots of flowers. 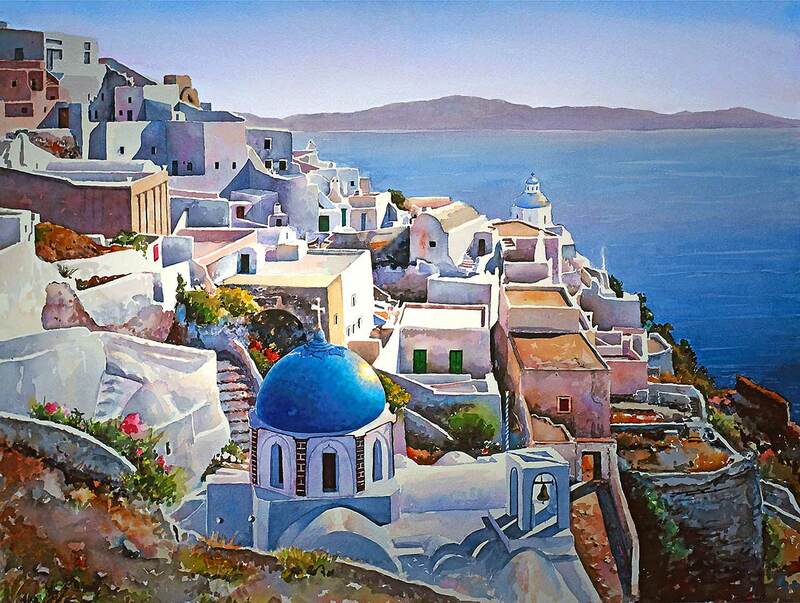 A days boat ride from Athens, set in the deep blue seas of the Aegean, one can find the beautiful Island of Amorgos. The blue domed churches that are found here are built by small groups of families. They are open for daily devotions and a traveling priest provides services such as baptism and weddings in the standing room only sanctuary. 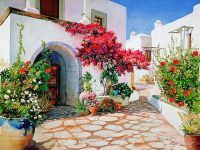 Amorgos also offers white washed houses, crystal clear waters and stunning sunny beaches to tourists from far and wide. 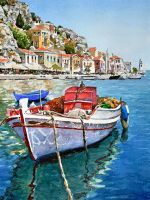 Greece is full of beautiful coastlines and harbors. 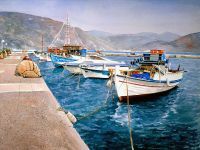 The colorful fishing boat in this picture are from the small town of Andikyra, located in central Greece. The sheltered harbor opens to the Gulf of Corinth. 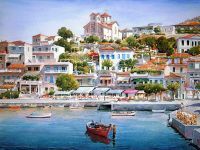 Andros is the northern most island of the Cyclades group. it is a delightful combination of sandy beaches, mountainous interior and picturesque villages. An abundance of water on the Island supports olive and lemon groves, vineyards and natural vegetation and wildlife. 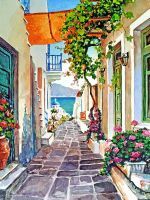 Artemonas is a charming town on the Island of Sifnos. 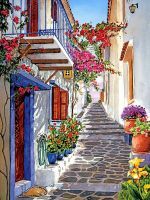 This picturesque alley is typical of those found on this small hilly island, renowned for it’s pottery, poetry and restaurants. 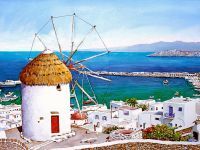 Venetian houses with ornate chimneys add to the attractiveness of the island which has become the most popular destination in the Western Cyclades. 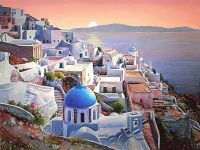 The Island of Santorini has a unique geography resulting from a long ago eruption of the still active volcano. During the eruption the cone exploded and fell back into the sea leaving a partly submerged cone surrounded by the now crescent shaped island. 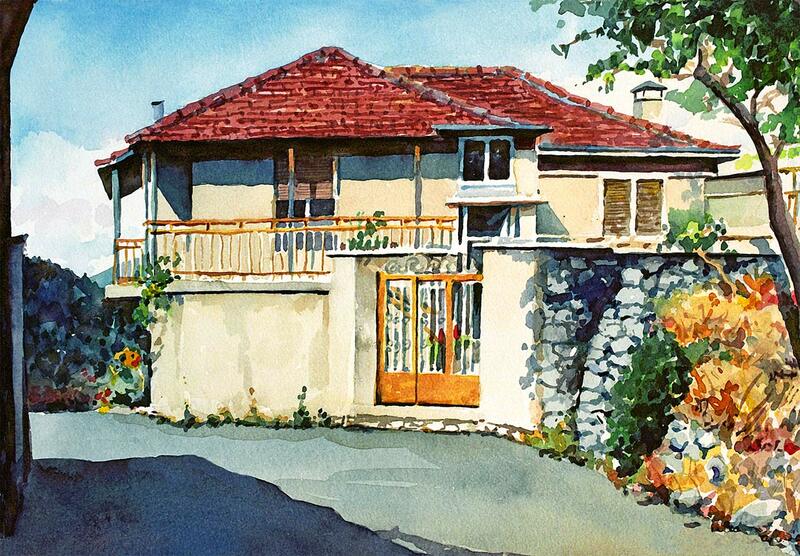 On one side small homes are built on the steep edge of the rock face providing a beautiful view of the bay. Many of the homes have rooms carved out of pumice stone rock left by the volcano. The other side of the island slopes gently to the sea from black volcanic beaches. Small family churches are dotted amongst the homes, their blue domes sparkling in the bright summer sun. 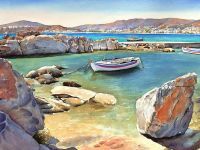 The Island of Chios is located on the Eastern Aegean sea, close to the Turkish mainland. This view is of the medieval village of Mesta which was built in the 14 & 15th centuries. The village was built in a fortress style. 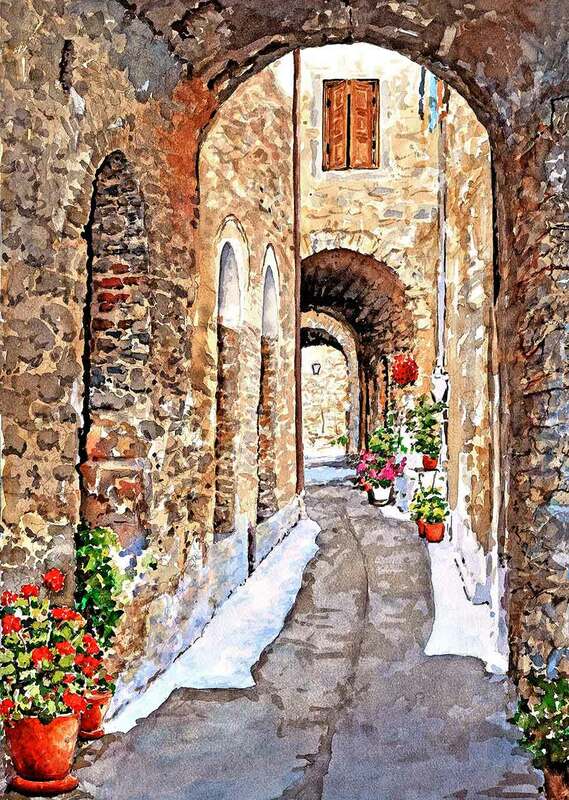 The stone houses have windows and doors that open only to the interior streets that are narrow and cobbled in the same stone. Maze like alleys were designed to confuse and trap invaders and pirates who were a common threat of the time. Arches were used to lend support to the tall structures which have stood the test of time in spite of frequent invasions and earthquakes. 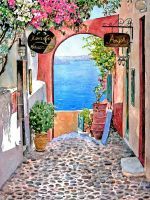 Ladies admire the view from a pathway that winds it’s way through the colorful neighborhood of Oia on the Island of Santorini. The Island has a unique geography resulting from a long ago eruption of the still active volcano. 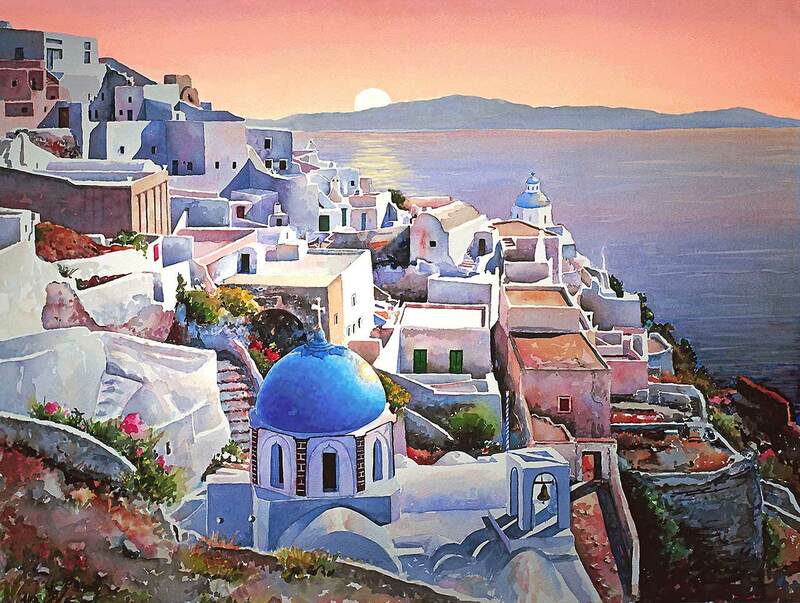 The crescent shaped island has one very steep side where small homes are built on the edge of the rock face. Many of the homes have rooms carved directly out of the pumice stone left by the volcano. 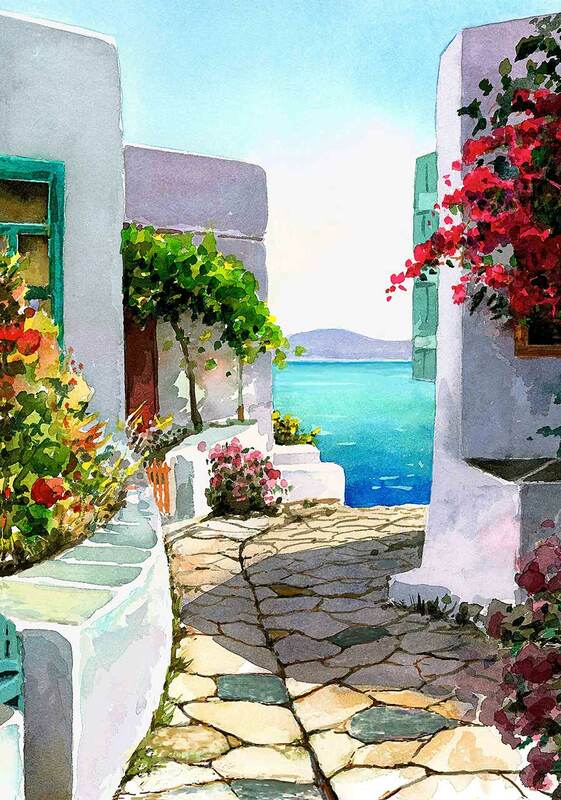 Colorful flowers and painted houses also make beautiful views from the bay. 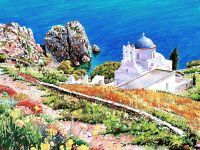 Corfu is part of the Ionian Islands. 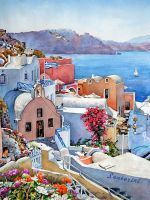 It is one of Greece’s most popular destinations and attracts thousands of visitors each year. 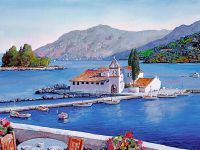 This view shows The Monastery of Panagia Vlacherna situated on a tiny islet and connected to the shore by an iron bridge. A gift shop supports and help preserve the monastery but there are no longer resident nuns. 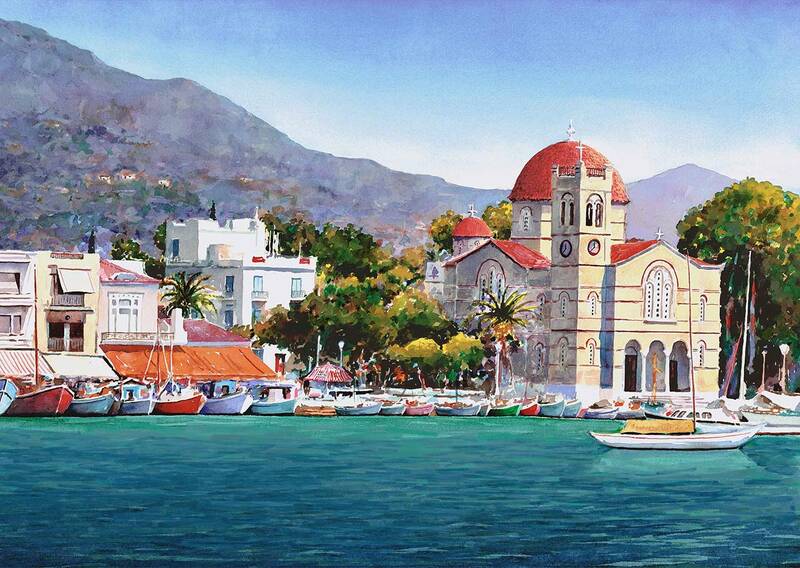 Mouse Island, home of Pontikonisi Chapel cane be seen in the background. 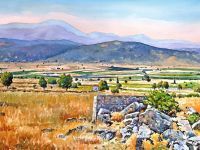 Ancient Corinth owed it’s importance to it’s location. 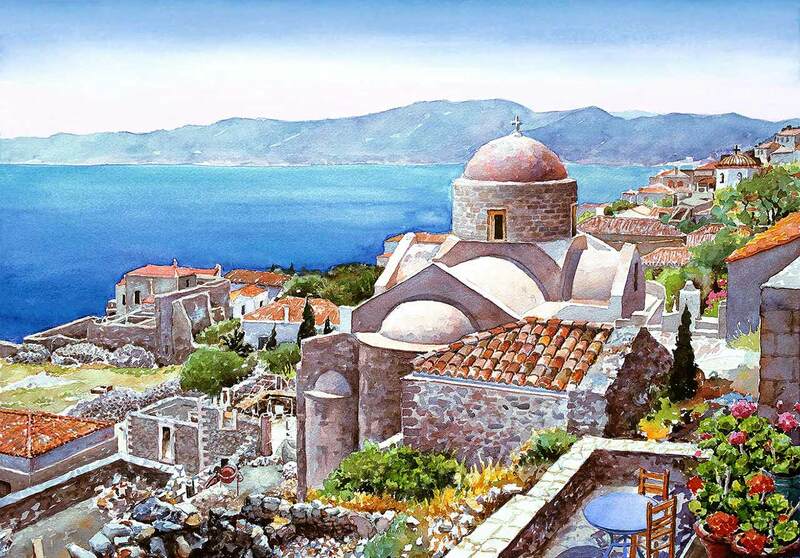 The town controlled the four mile wide isthmus, the only land route to the Peloponnese. 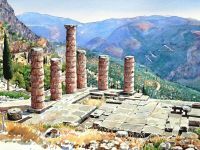 The Temple of Apollo was built about 540 b.c. and is an excellent example of Doric architecture. The area is prone to earthquakes and only seven of it’s original columns survive. 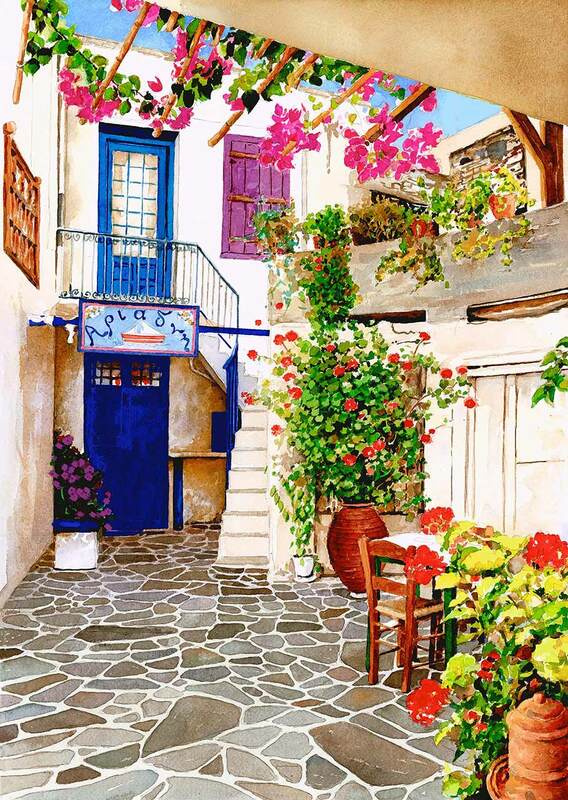 This picturesque courtyard is part of the Old Market in the harbor town of Hora , on the Island of Naxos. Modern times find numerous cafes and gift shops in the maze of small streets ( designed originally to thwart easy passage through the town by pirates and invaders). The name on the shop sign pays tribute to Ariathni; daughter of King Minos of Crete. She helped Theseus; later King of Athens, kill the dreaded Minator of Knossos. 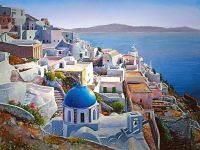 Popular belief has it that Ariathni ran off with Theseus and headed for Athens but while getting provisions for the ship Theseus abandoned her on the island , where she became known as Ariathni of Naxos. 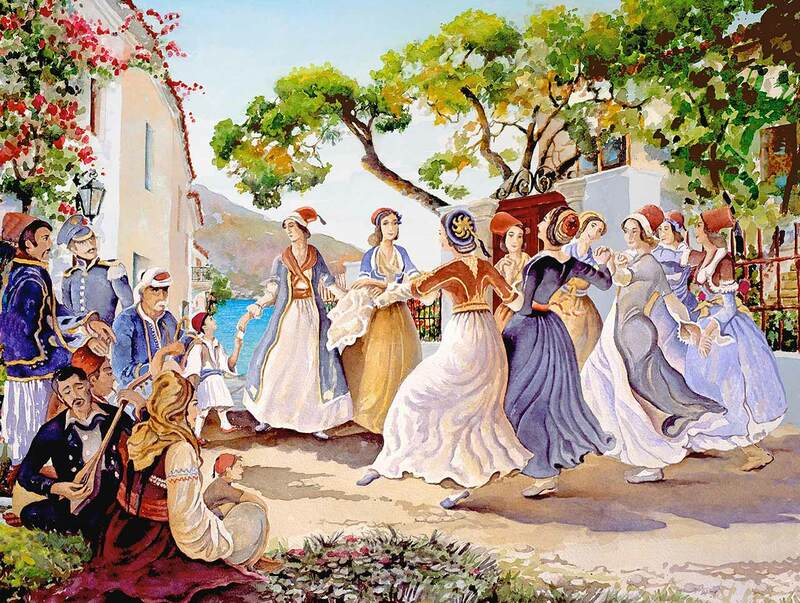 This painting depicts dancers in beautiful traditional costumes performing a line dance in a nineteenth century greek village. 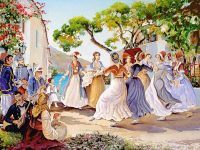 Families would get together to feast, play music and dance on special occasions such as weddings and holidays. 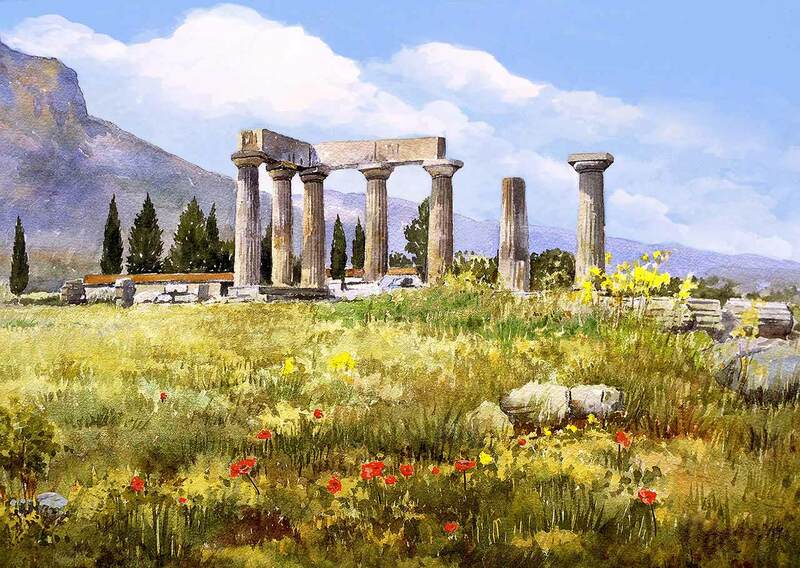 The ruins of The temple of Apollo date back to the 4th century b.c. 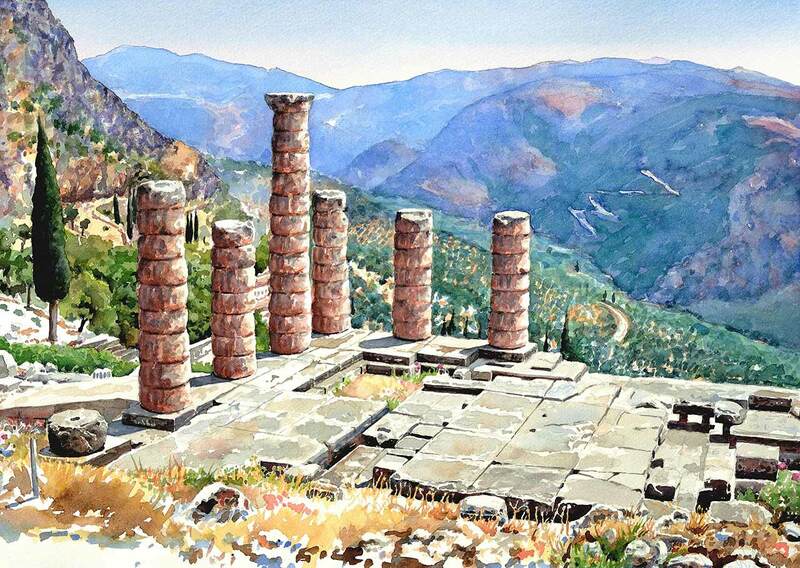 Delphi has a rich history and is the site of two earlier temples. 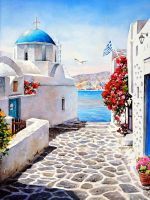 Ancient Greeks considered it the center of the world and pilgrims from all over the ancient world came to the Oracle to seek advise on war, politics and family matters. 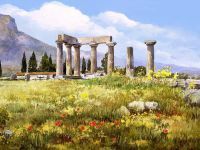 Games and competitions were also held in Delphi . 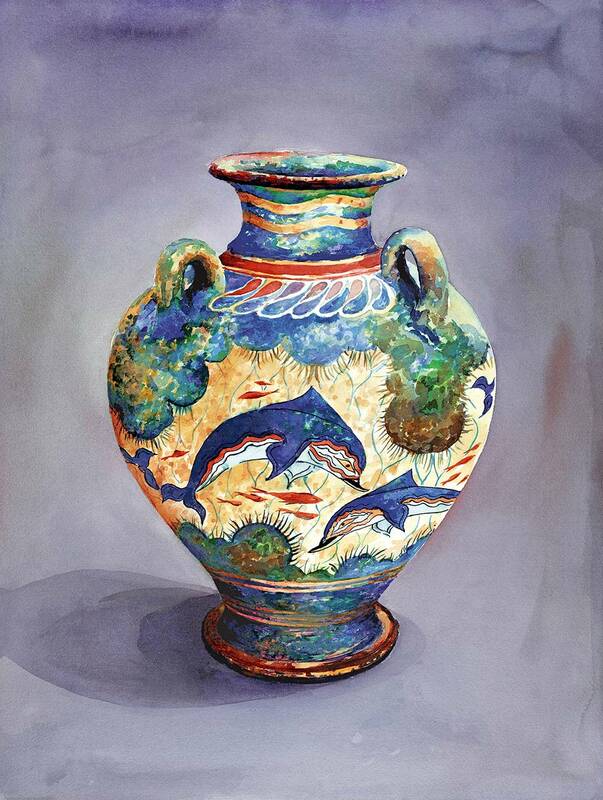 Known as the Pythian Games, they originally focused on music and poetry which were held in high regard by the Gods. Athletics were later added to the events. 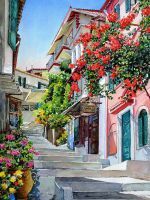 Fiscardo is a port village on the Island of Cephalonia. Summer brings many visitors to this attractive area. 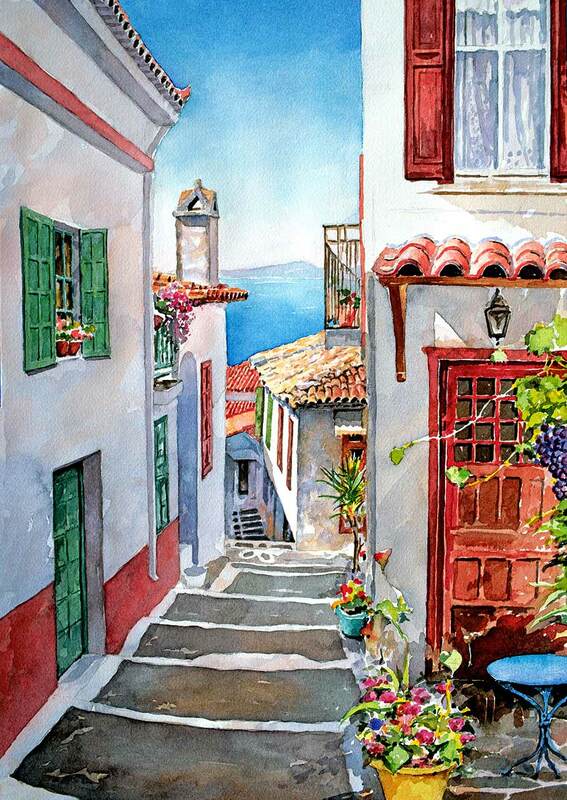 Port side buildings display traditional colors and the picturesque harbor is berth to yachts from near and far. 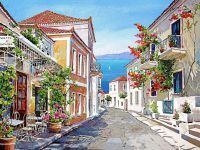 Galaxithi is a beautiful old port town in central Greece, situated on the Gulf of Corinth. The 18th and 19th centuries saw great prosperity for sailing ship owners in this town and during that era many fine mansions were built. Trade was lost to the competition from steam ships but the beautiful buildings remain as a reminder of past glory. 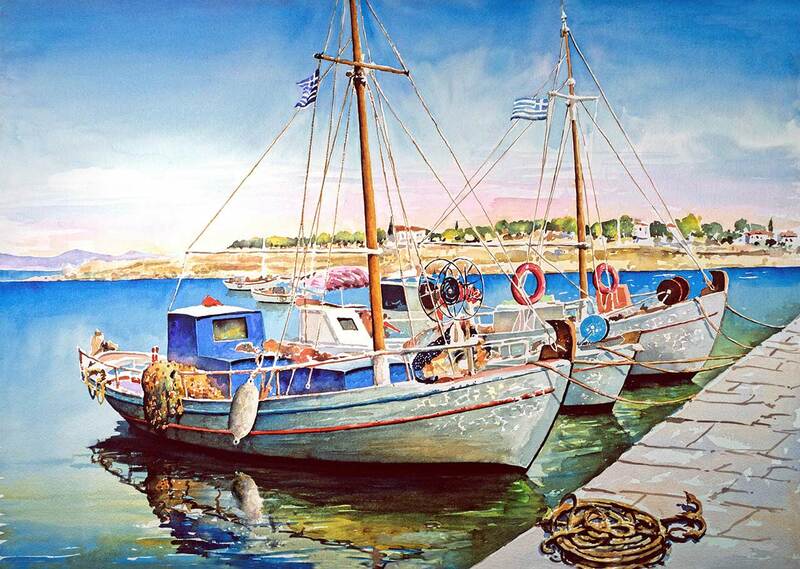 On any of the hundreds of Greek Island you can see these fishing boats called kayikis. They are broad flat boats painted in vibrant colors that have been sun bleached to beautiful pastel hues. 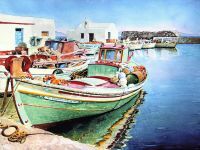 This boat was in the village of Naousa. Gythio is a small coastal town on The Southern Peloponnese. 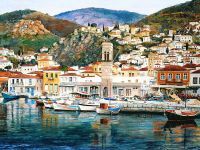 In antiquity it was the main port of Sparta and later during The Greek War of Independence, an important center for fleet operations. Today it is a hub for tourists who travel there to catch a ferry to distant islands. 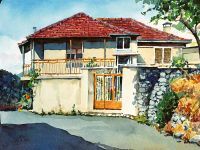 Tall old houses painted in pastel colors dot the wooded hillside. 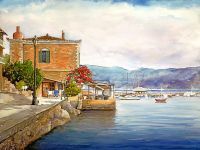 Seafood restaurants surround the harbor and patrons gather for the local speciality; tasty dishes made from octopus caught fresh from the Gulf. 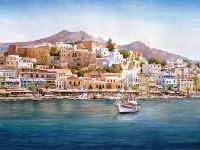 The Port of Emborio is the center of activity in this small picturesque island situated in the Dodecanese Group of the Aegean Sea. It has a small year round population of about 400 people but swells with summer tourists. The ruined medieval castle of The Knights of St John would have sheltered Christian s on route to the Crusades, The small chapel is of interest for some original frescos. 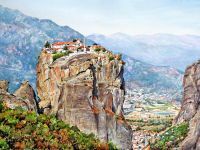 Meteora is the site of an important group of monasteries in Central Greece. Their history can be traced from the 11th century when hermits settled there. Aghia Triada or Holy Trinity sits atop a slender pinnacle and is accessible by 140 steep steps which were hewn from the rocks in 1925. In the 5 centuries prior access was by rope basket. People and goods were raised by monks using a pulley system. 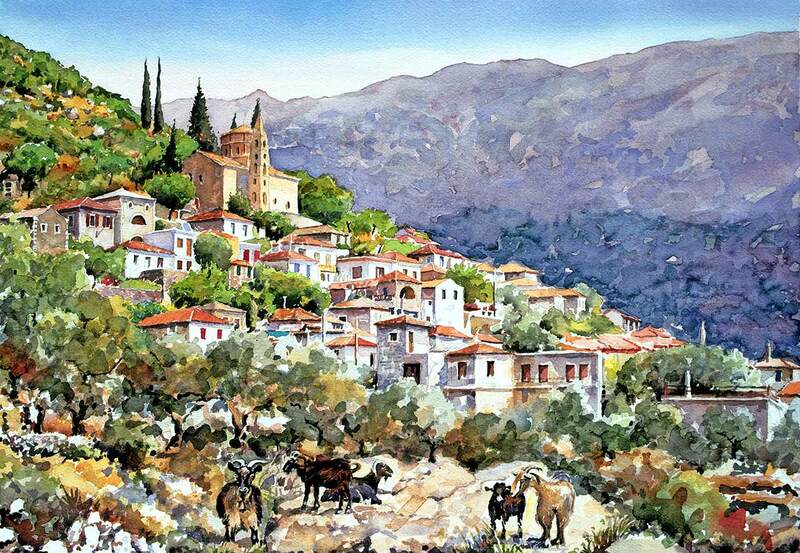 In the distance the picturesque town of Kalambaka can be seen. 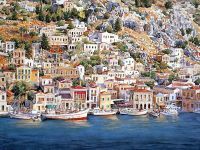 Hydra is one of the Saronic Islands. It’s proximity makes it a popular destination for day trips from Athens. 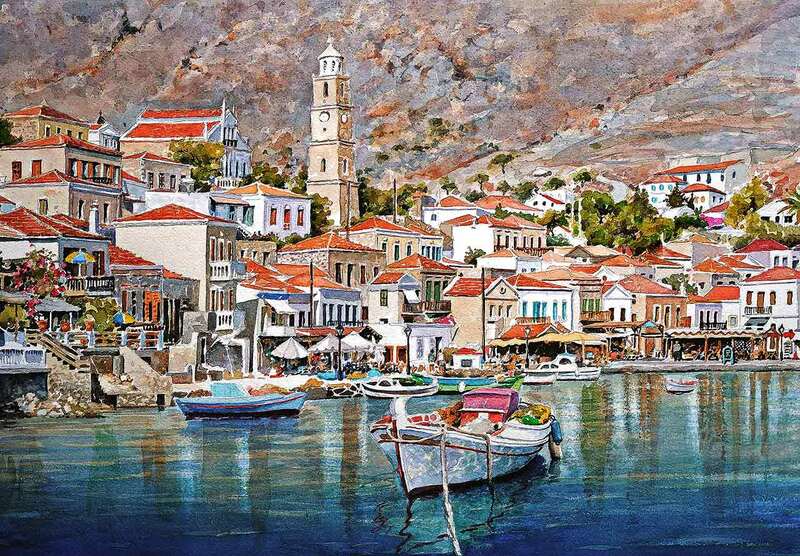 The harbor town is also named Hydra. All around the bay picturesque white houses are interspersed with great stone mansions, built by shipping wealth from past centuries. 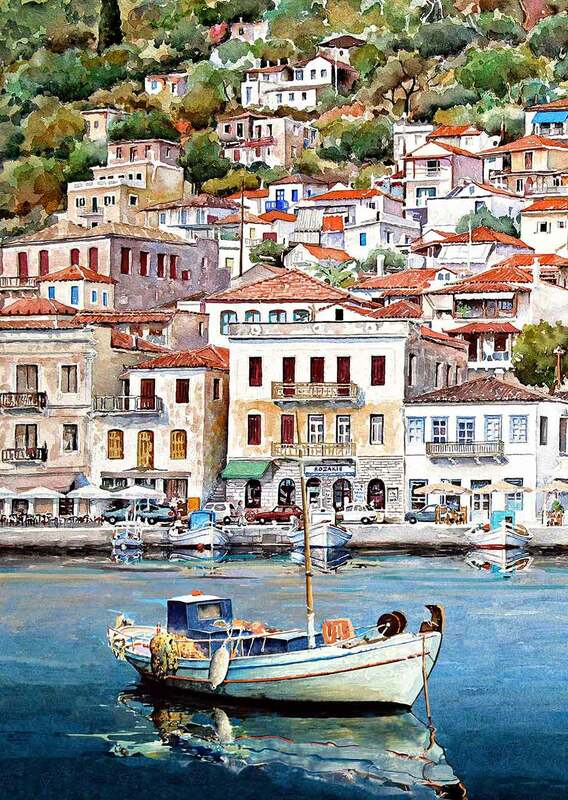 Colorful shops line the quay, but the 18th century clock tower from the Monastery of Panagia dominates the view. 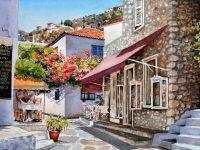 Hydra is one of the Saronic Islands. It’s proximity makes it a popular destination for day trips from Athens. 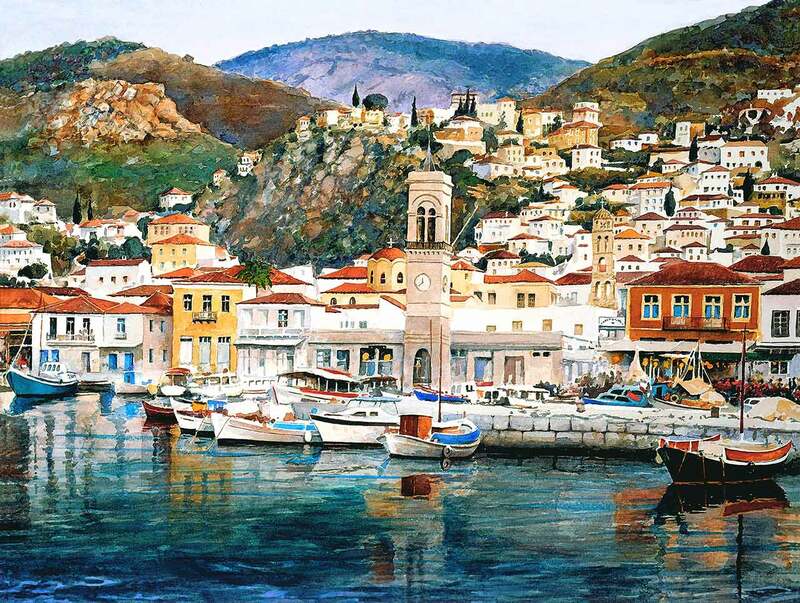 The harbor town is also named Hydra. 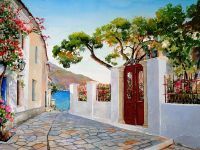 All around the bay picturesque white houses are interspersed with great stone mansions built by shipping wealth from past centuries. 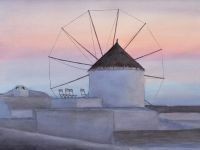 These windmills are on Ios, one of the Cyclades Islands. 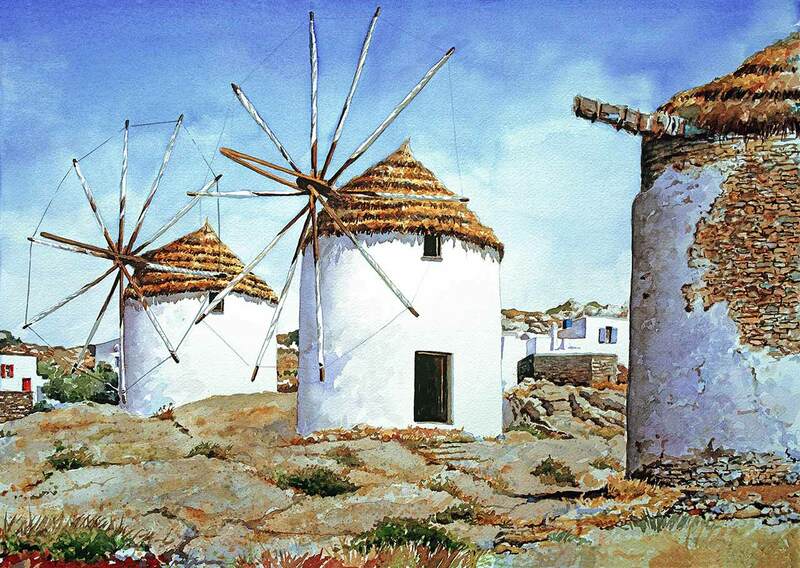 The mills once made a valuable contribution to the economy, providing the power to grind local grain. Today they stand as a picturesque landmark on an island that has earned a reputation as a great party island for young travelers. 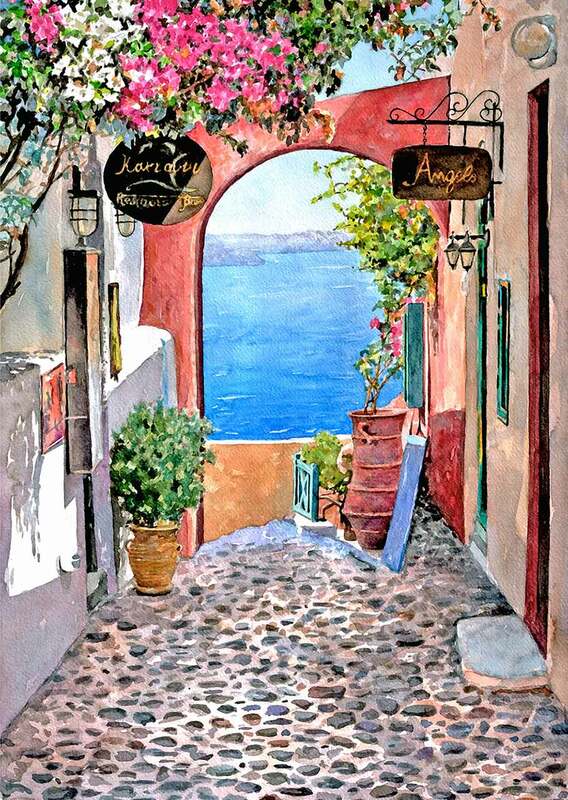 This walkway is lined with tables from a small restaurant which invites diners to eat, relax and enjoy the view. 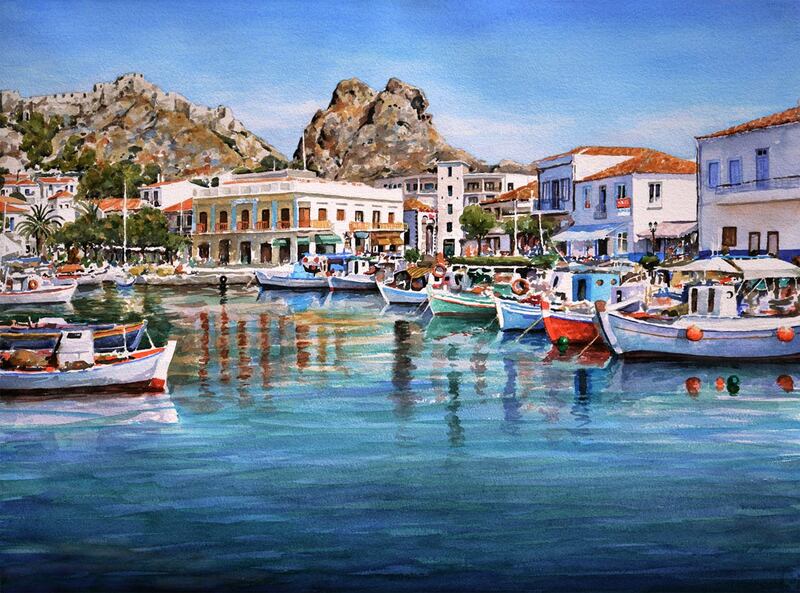 This is a small port town on the Aegean Island of lemnos. 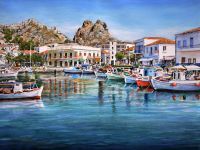 The island has been inhabited since Paleolithic times and ancient myths dedicated Lemnos to the fire God Hephaestas. Today the island is a popular tourist destination. Karpathos is one of the twelve islands of the Dodecanese group, lying off the southern tip of The Aegean Sea. 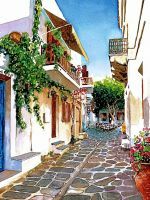 It is situated between the larger, better knownIslands of Rhodes and Crete. 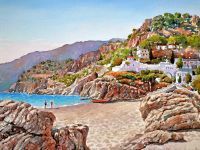 Most of Karpathos retains its original beauty and natural pine forests and pristine beaches await nature loving visitors. 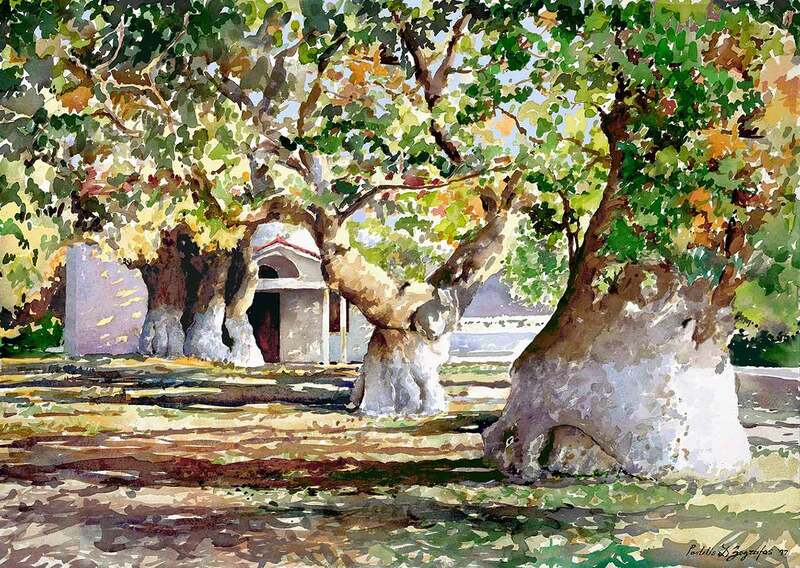 These great oaks are in the town of Karyes on the Peloponnese. They are held in high regard because of their age and size. 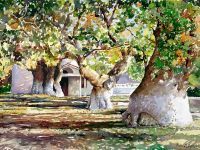 One of the oaks which has become hollow over the years was used to house a tiny kafenion from which coffee was served during church events. 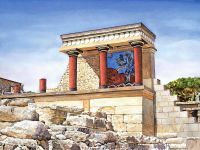 The Palace of Knossos is situated on the Island of Crete, in the Southern Aegean Sea. 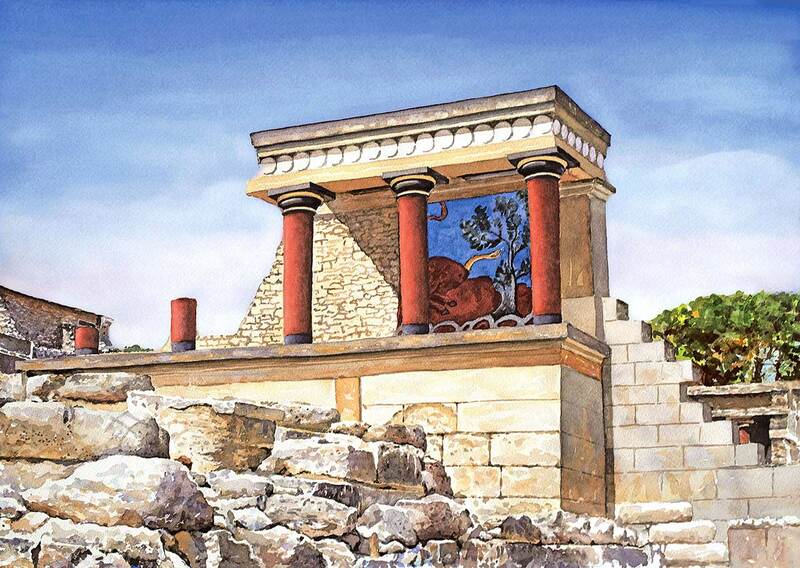 It is a huge bronze age architectural site that sheds light on the Minoan civilization that once thrived there. The picture is of the bastion at The North Entrance and is noted for it’s colorful bull fresco and decorated columns. 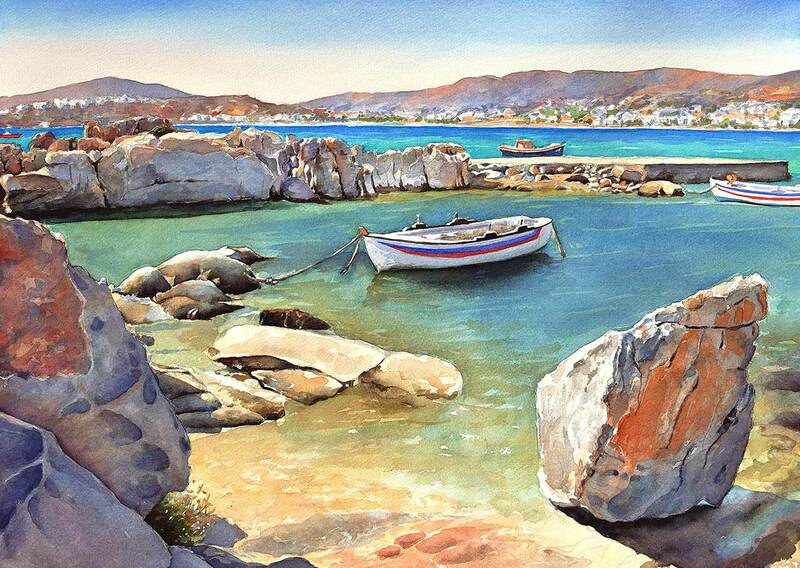 This beach on the Island of Paros is known for it’s rock formations. They provide shelter from coastal winds making it an ideal beach for families. The beach took it’s name from a baptismal font. Time and water has eroded the rocks to form a cavity that looks like a large font. 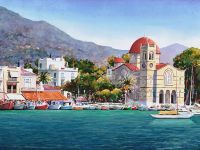 The red domed church is Kyra Panagia ( Mrs Madonna). 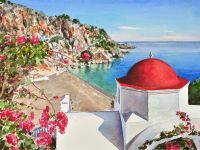 It is located in Karpathos, one of the twelve islands of the Dodecanese group, lying off the southern tip of The Aegean Sea. 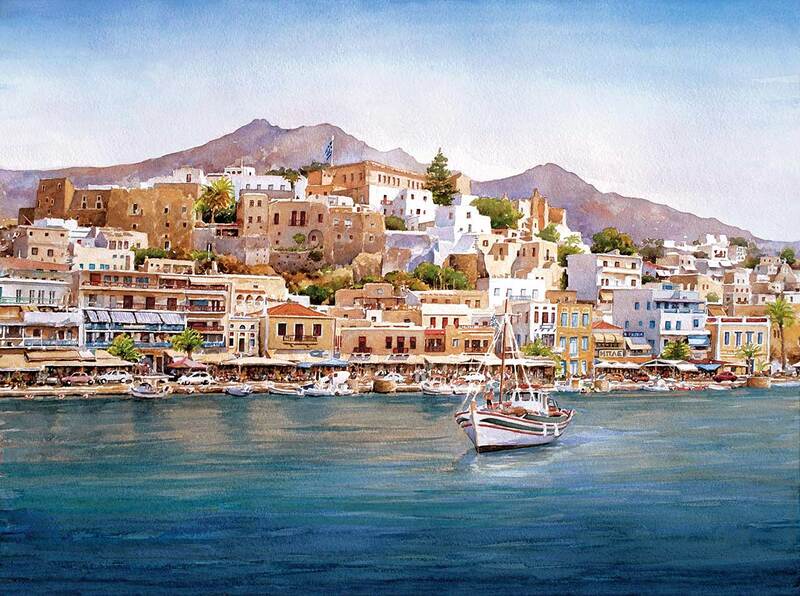 The island is situated between the larger, better knownIslands of Rhodes and Crete. 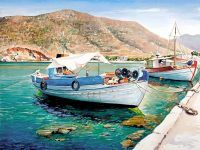 Most of Karpathos retains its original beauty and natural pine forests and pristine beaches await nature loving visitors. 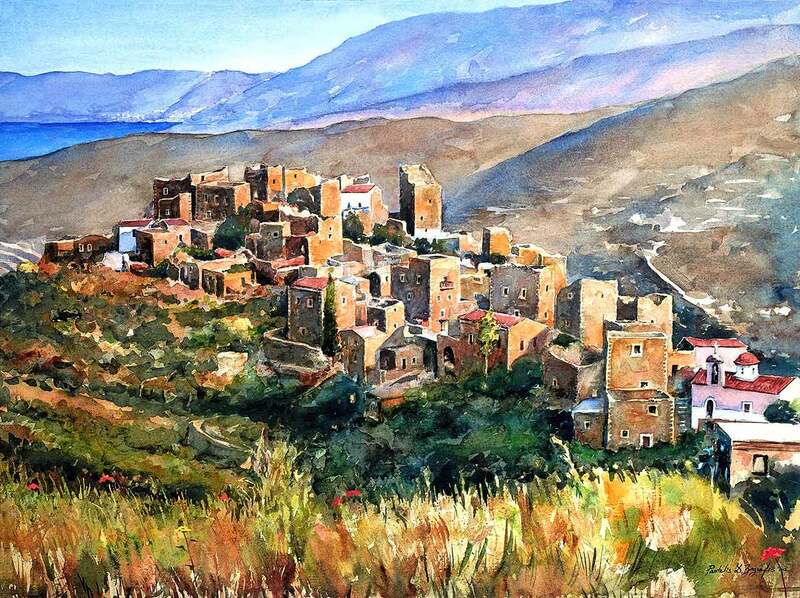 Mani is an arid isolated region located in Southern Peloponnese, where stunted olive trees and prickly pear survive. 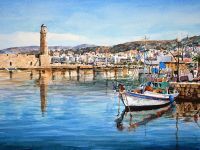 Descendants of ancient Spatans lived in the area and in the middle ages were joined by refugees from the Byzantium nobility. They established a local aristocracy and formed competing clans with rights to erect tower mansions, up to five stories high, to use in combat. Poor recourses spurred banditry and blood feuds which lasted for years. The invading Ottomans chose to encourage the feuding. Rather than rule Mani directly, they appointed a ‘bey’ from the clans to oversee the region. Petros Mavromikhalis united the clans while instigating the Greek Uprising of 1821. 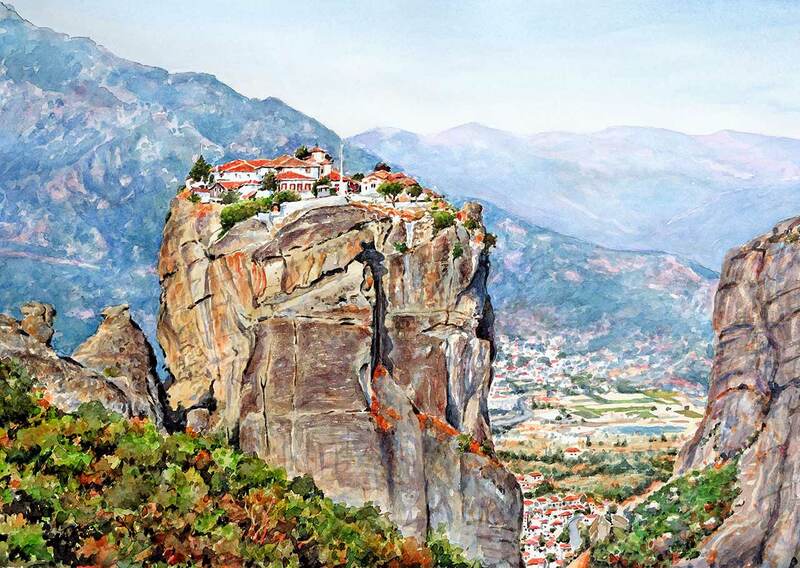 Meteora is the site of an important group of monasteries in Central Greece. Their history can be traced back to the 11th century when hermits settled there. The Holy monastery of Saint Rousanou was founded around 1560 a.d. Until recent times access to the building was by a rope basket which was lowered by monks using a pulley system. People and supplies were raised and lowered from a balcony at the right of the building. 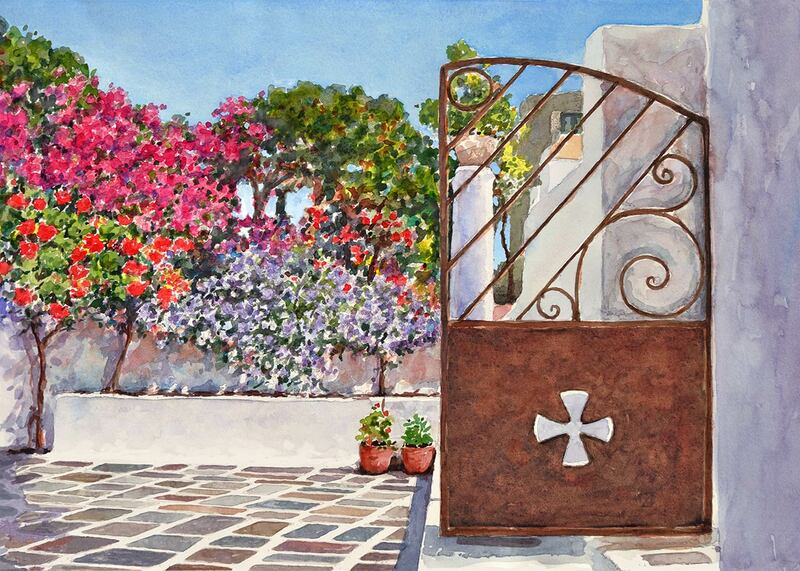 This fragrant garden is located at the Archeological Museum on the Island of Milos; one of the Cyclades group. 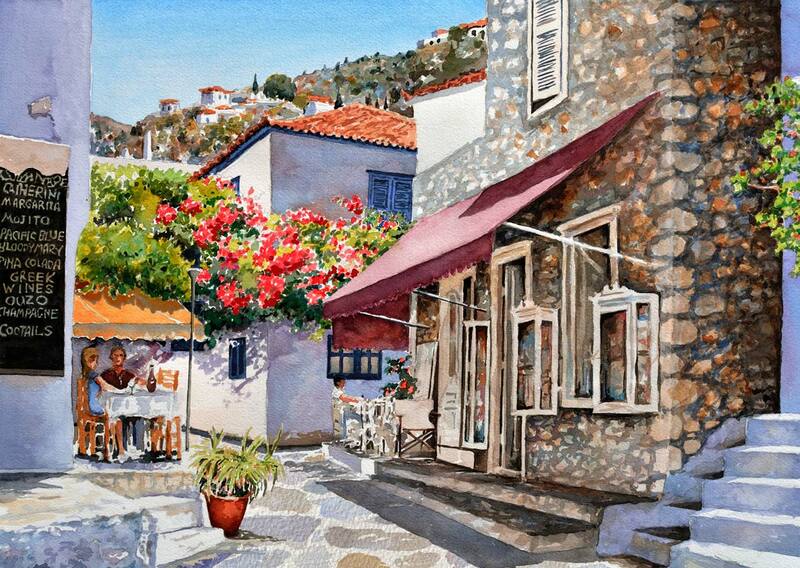 Molyvos, a harbor town of stunning beauty and historic importance is located on the Island of Lesvos. A medieval castle built by the Byzantines sits atop a small hill and a 1965 preservation order ensures that the town maintains the beautiful style of natural stone houses. 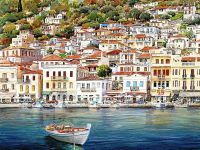 Culture seeking tourists find Molyvos an enchanting destination but small farms, olive groves and fishing is still an important part of everyday local life. 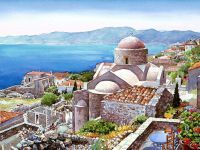 Monemvassia is located on a small peninsula off the East Coast of the Peloponnese and consists of a fortress and a small village. Founded in the 6th century a.d. by people seeking refuge from invaders. It was under Byzantine rule until 1471 when it was sold to the Pope. A few years later it was taken by Venetians and later by the Ottomans. 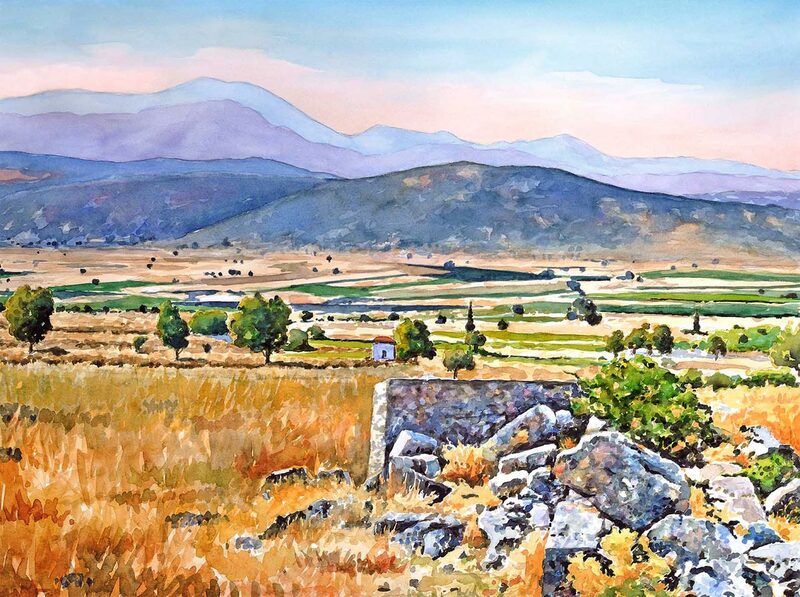 During the Greek War of Independence it was liberated by a small private army led by Tzennetakis Grigorakis. Today many of the medieval buildings have been restored and it has experienced a resurgence of importance as a tourist destination. 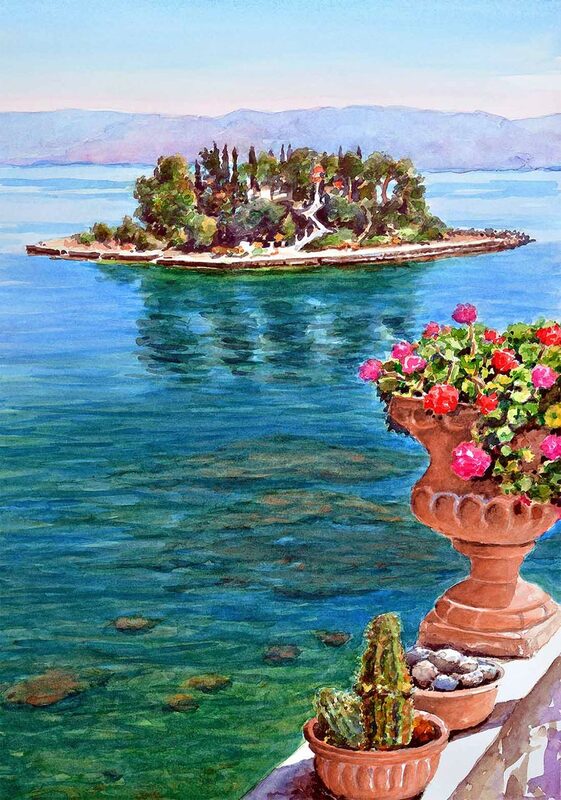 Pontikonisi is a small lush island, close to the Old City District of Corfu. 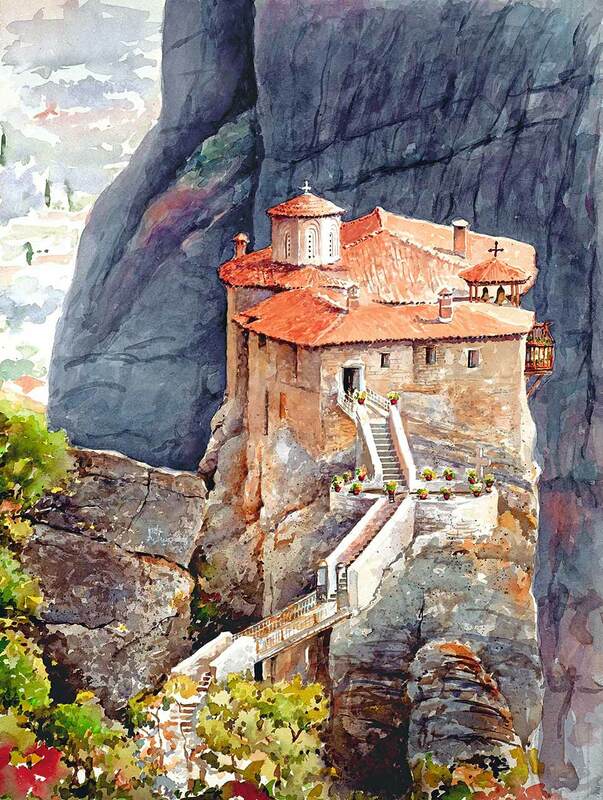 Built on the islands highest elevation; about 2 meters above sea level, is the Monastery of Pantokrator. Most of the structure is obscured by vegetation but a white stone staircase winds down from he monastery to a boat jetty. When seen from a distance the stairs resemble a mouse’s tail, hence the island’s name (mouse Island). This view is enjoyed by diners at a nearby restaurant patio. 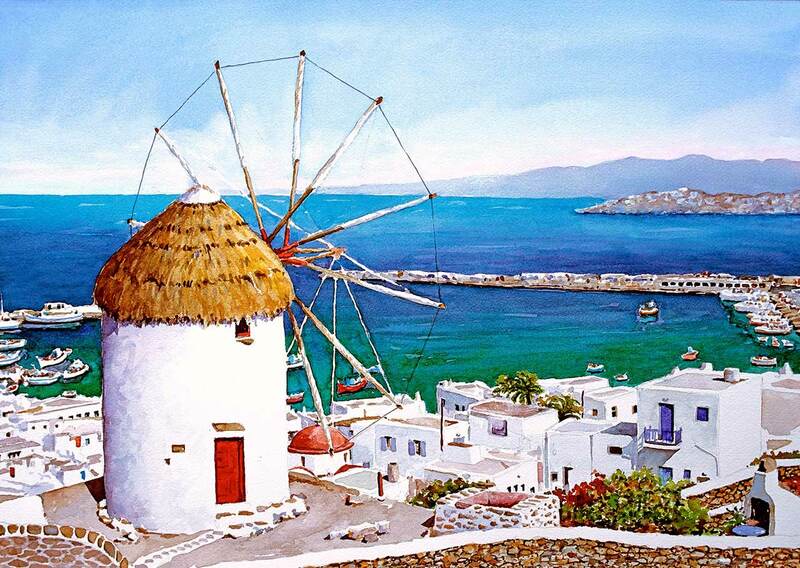 Historic windmills are the most recognized landmarks on this internationally known island. For decades the beautiful sandy beaches and sunny climate have drawn people from all over the world to this well known vacation spot. It has become renowned for it’s lively night life, now being ranked among the top clubbing destinations in the mediterranean. 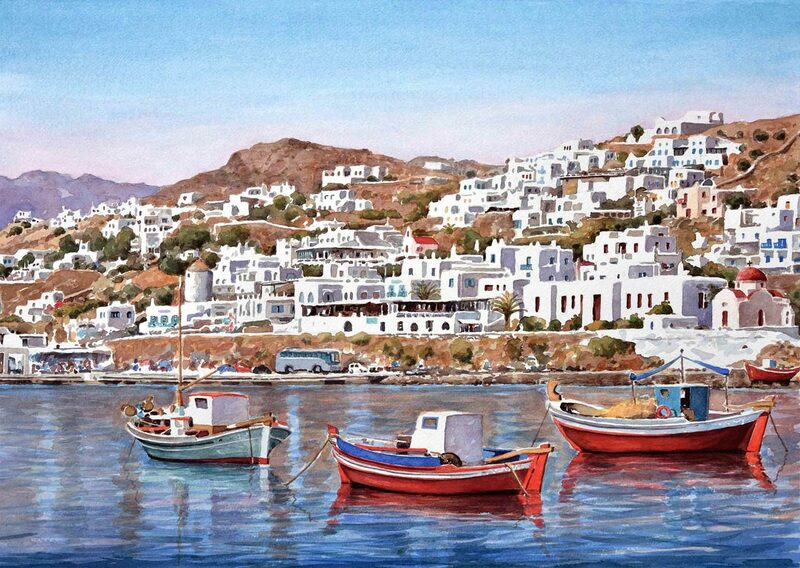 This picturesque harbor where colorful fishing boats decorate the tranquil waterfront is Mykonos. For decades the beautiful sandy beaches and sunny climate have drawn people from all over the world to this well known vacation spot. It has become renowned for it’s lively night life, now being ranked among the top clubbing destinations in the mediterranean. 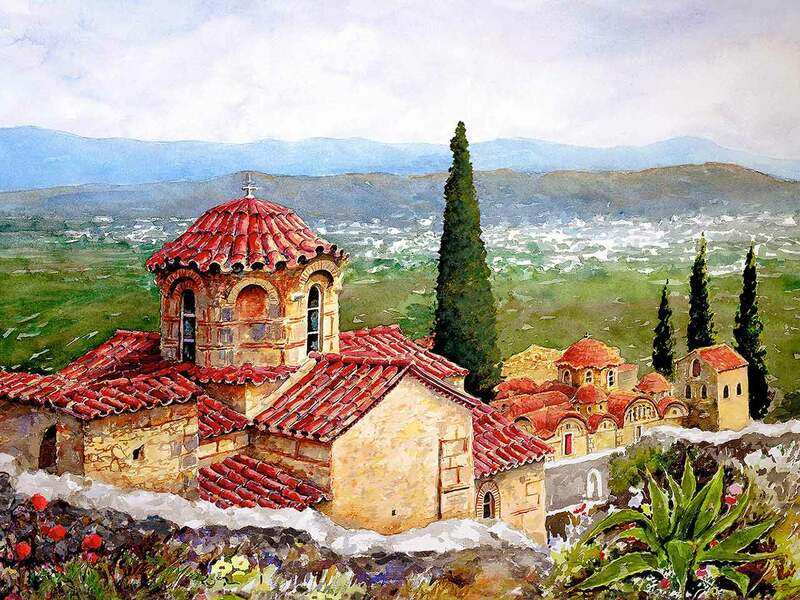 Mystras is located on the Peloponnese close to Sparta. 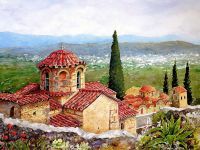 Byzantine architecture from the 13th and 14th centuries is abundant and records show that in 1448 the late emperor of Byzantium, Constantine XI Paleologos was crowned there. In 1834, thirteen years after the liberation from the Ottoman empire, the modern City of Sparta was founded. This marked the end of the old towns life. This scene shows Our Lady of Evangelista (the Annunciation). 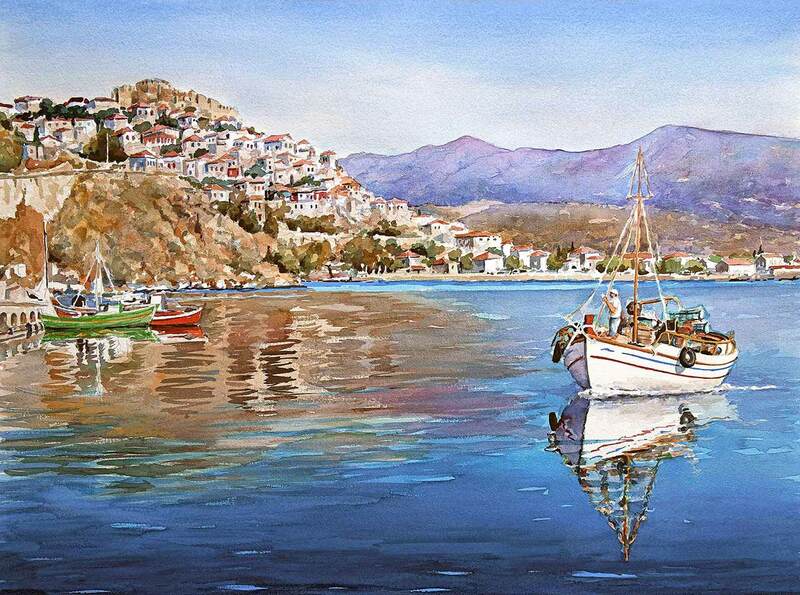 Local tradition tells that Nafplio was founded by the son of the sea god Poseidon. 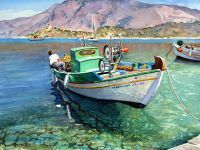 It is situated on The Gulf of Argolis in Western Peloponnese. 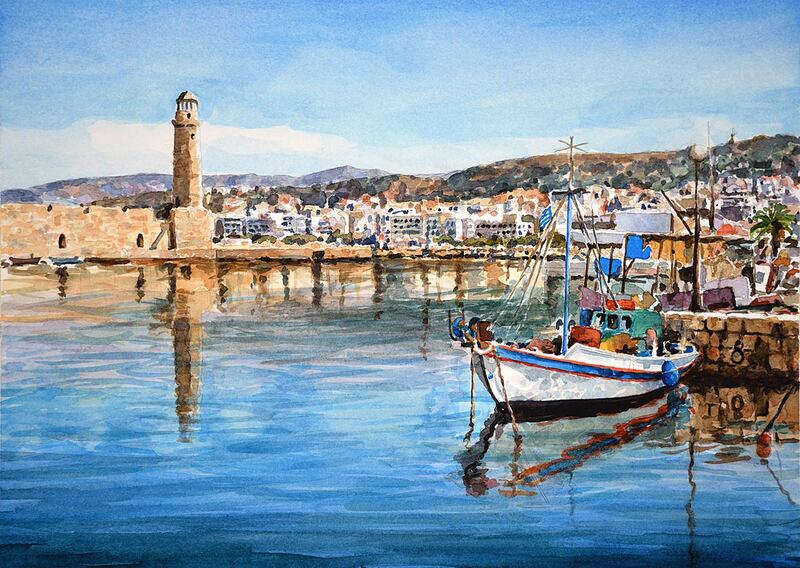 It has been an important town since the early 13th century when the Byzantines repopulated the area. 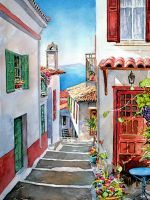 Nafplio has preserved fortresses and buildings from many eras and it’s proximity to Athens make it a popular weekend destination. 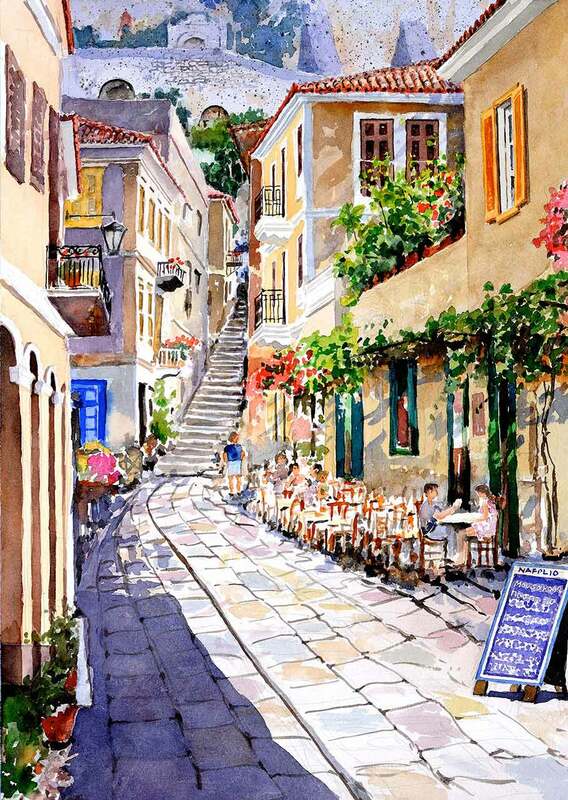 This outdoor cafe is on a road winding up to the castle in Nafplio. 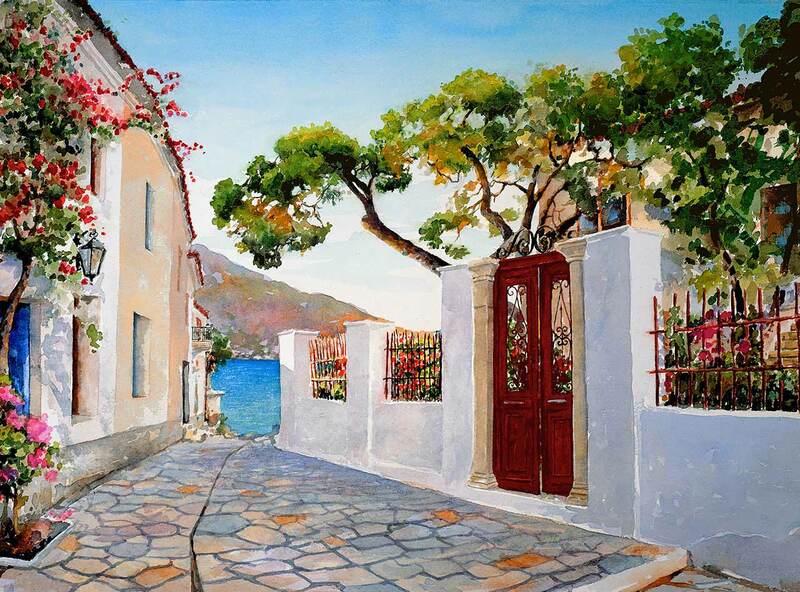 Local tradition tells that Nafplio was founded by the son of the sea god Poseidon. It is situated on The Gulf of Argolis in Western Peloponnese. 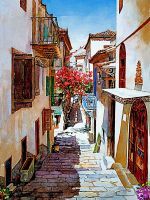 It has been an important town since the early 13th century when the Byzantines repopulated the area. 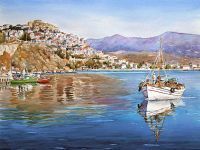 Nafplio has preserved fortresses and buildings from many eras and it’s proximity to Athens make it a popular weekend destination. 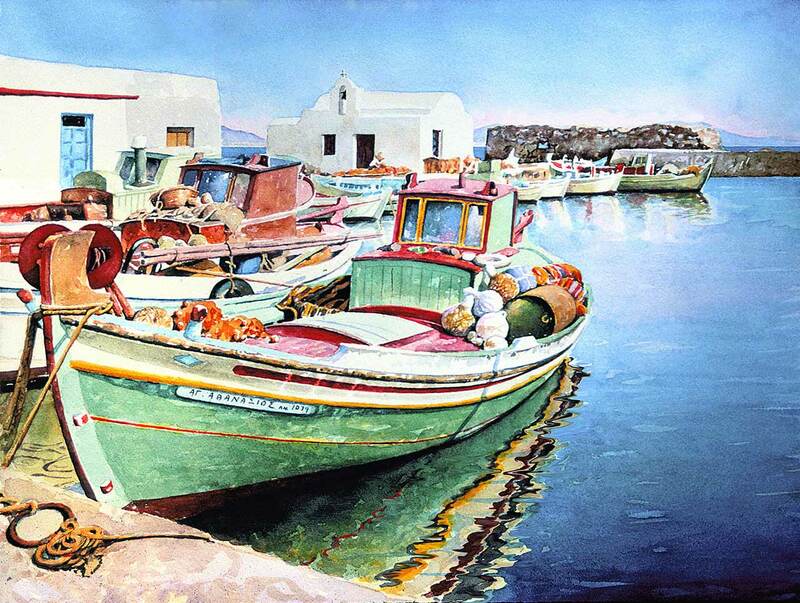 The Island of Naxos in the Cyclades group is home to these colorful fishing boats. 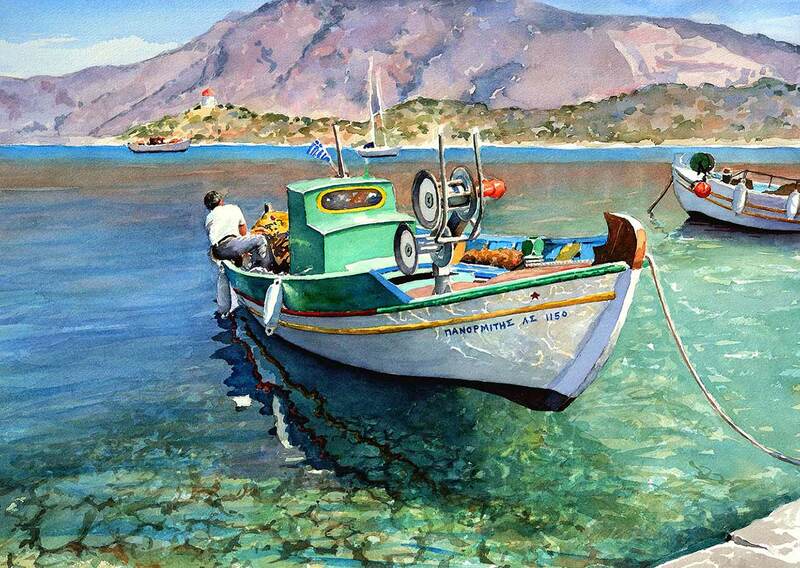 They are owned by fishermen from the small village of Apollo. A couple of small restaurants on the beach serve food and drinks, under a covered patio. It is an ideal location to sit and enjoy the view after a day at the beach. 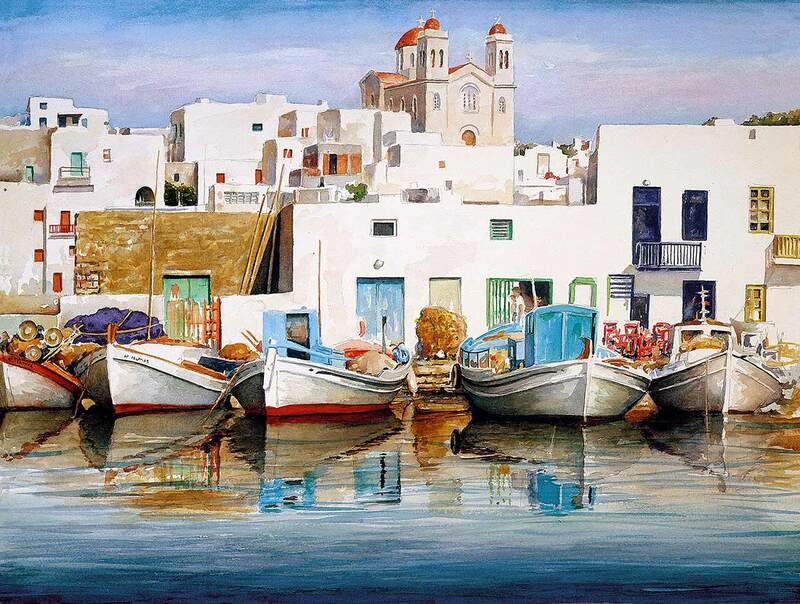 This is a view of the beautiful waterfront in the main town of Naxos (Chora). 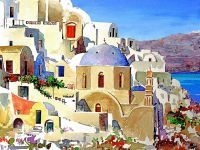 The island is the largest in the Cyclades group and has a diverse economy, making it a lively place year round. 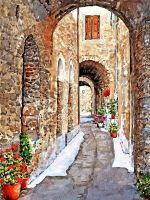 A venetian castle dominates the hillside and small streets wind down to the waterfront in a maze designed to confuse pirates of bygone days. Restaurants and gift shops dominate the waterfront which is a popular place for an evening stroll. 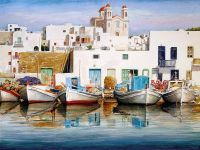 The Island of Paros in the Cyclades is the location of Naousa; a bustling fishing village nestled in a natural harbor. Seafood restaurants with outdoor seating line a small quay and the busy commotion of the sunny day gives way to a tranquil ambience as the quay transforms into a popular restaurant destination. 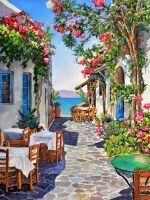 Diners and an occasional wandering cat savor the bounty of the sea confident in it’s freshness. This view of the narrow streets in the old part of town shows beautifully colored buildings. 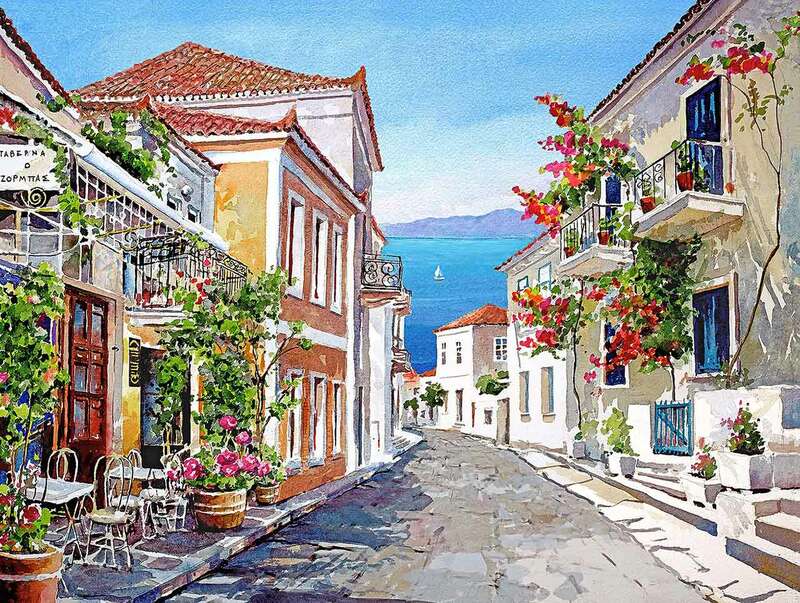 The architecture has a Venetian influence, common to the Islands on the Western side of Greece. The monastery of Our Lady of Pandanassa (Queen of all) has a church of mixed architecture featuring exterior porticos and a bell tower. 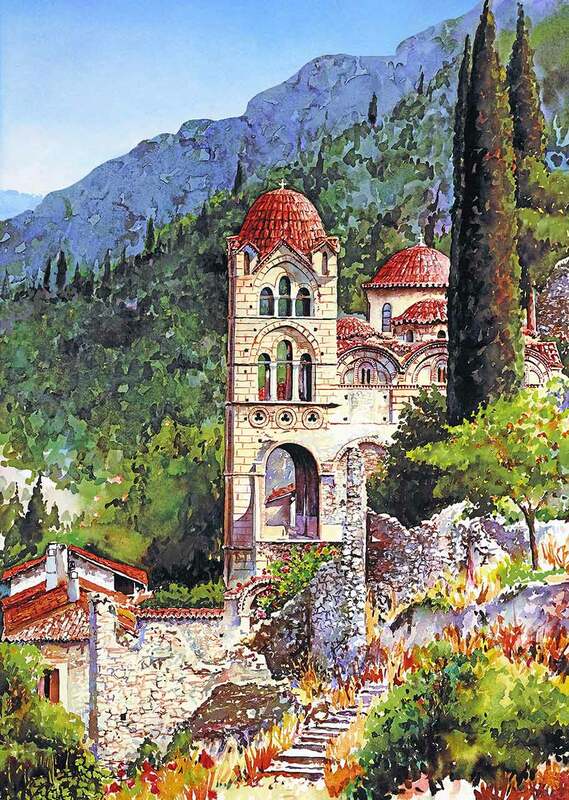 The monastery is in the Mystras region, close to Sparta. This colorful boat, known locally as a kayiki, is used by locals to fish nearby waters. 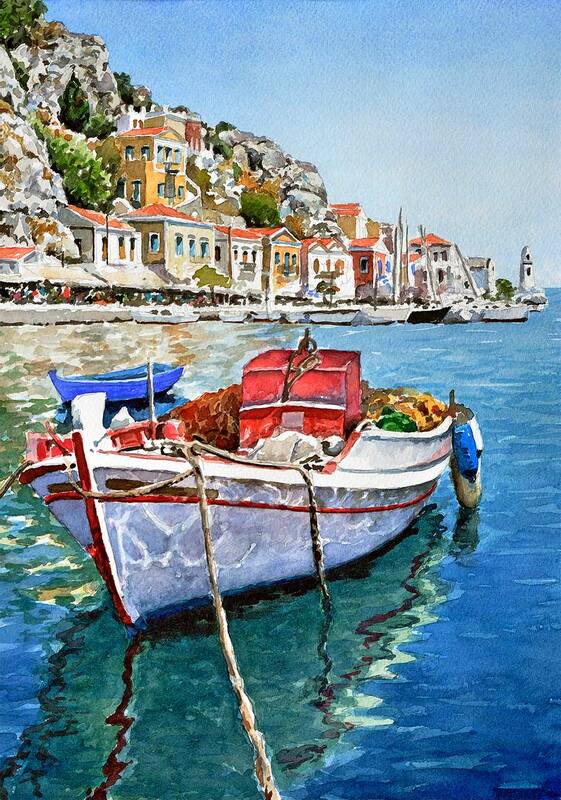 This one is located in a small bay on the Island of Symi. 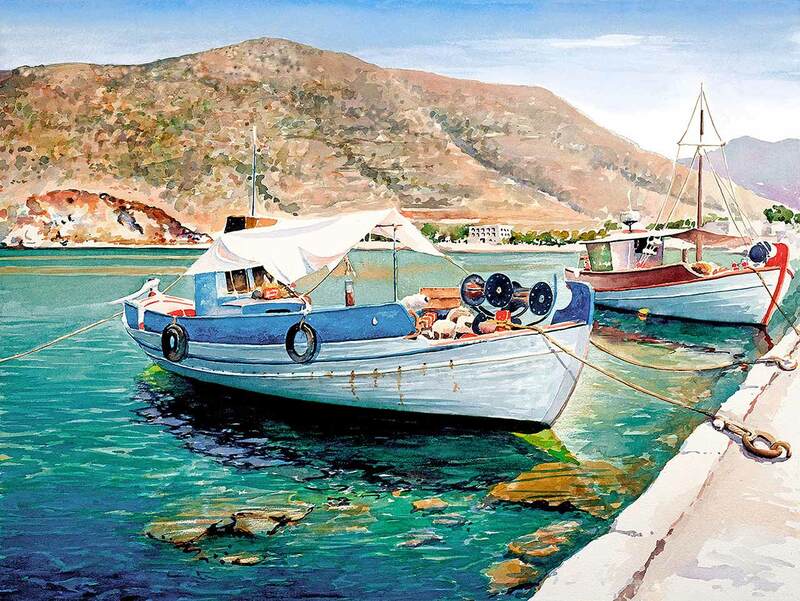 The boat is named Panormitis after the local monastery. 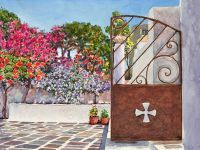 Saint Michael of Panormitis Monastery is a large active facility that attracts pilgrims from all over the world to it’s annual Pentecostal festival. 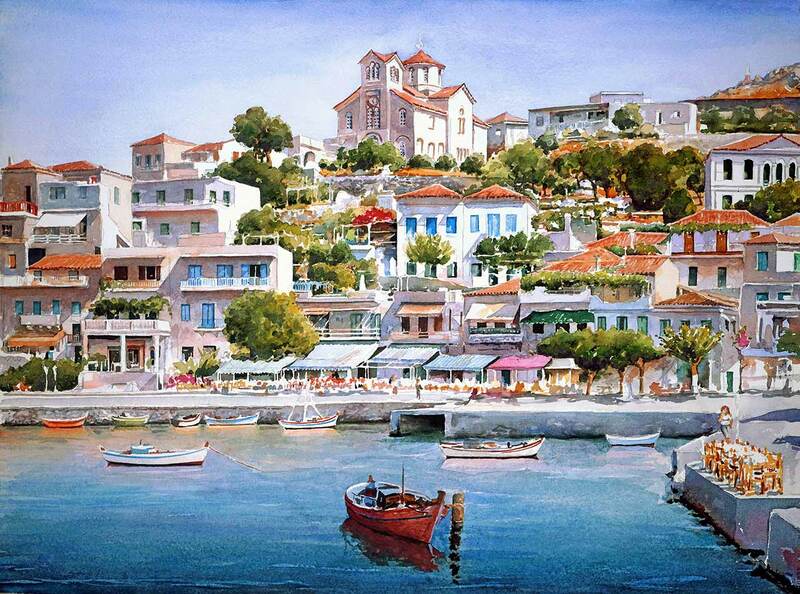 Parga is a small picturesque town on the coast of Mainland Greece that has an island feel. Colorful houses can be seen on the mountain side above the sheltered harbor. 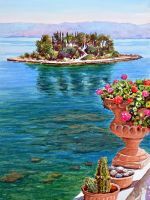 An old venetian castle sits on top of a rocky outcrop. 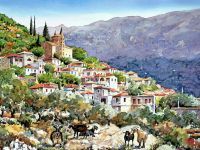 Groves of ancient olive trees surround the town and are an important part of the towns economy. 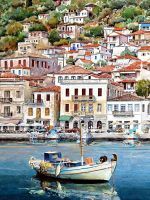 The tranquil sea, pretty old houses and colorful harbor boats make for a peaceful scene, which belies the town's long and tumultuous history. 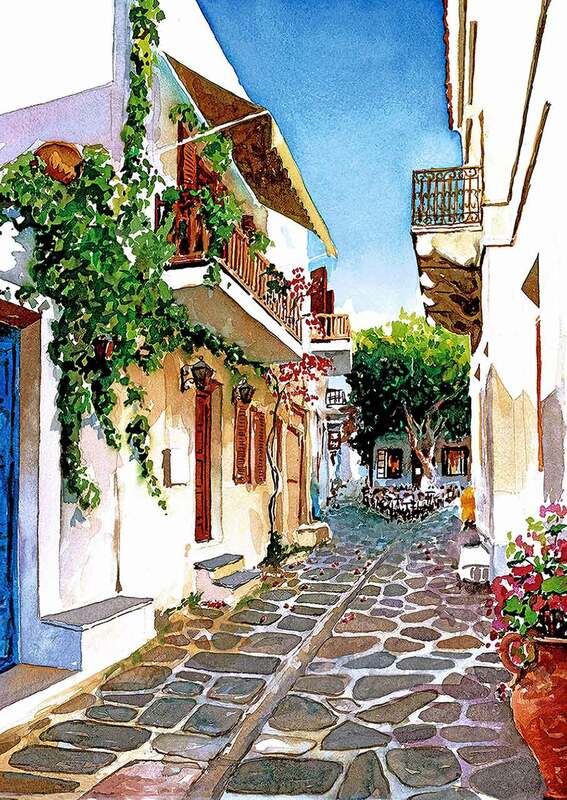 This picturesque cobblestone street is situated in the port town of Parakia on the Island of Paros. It leads to a fork in the road where the tables of a small tavern take advantage of the shade of a large tree. 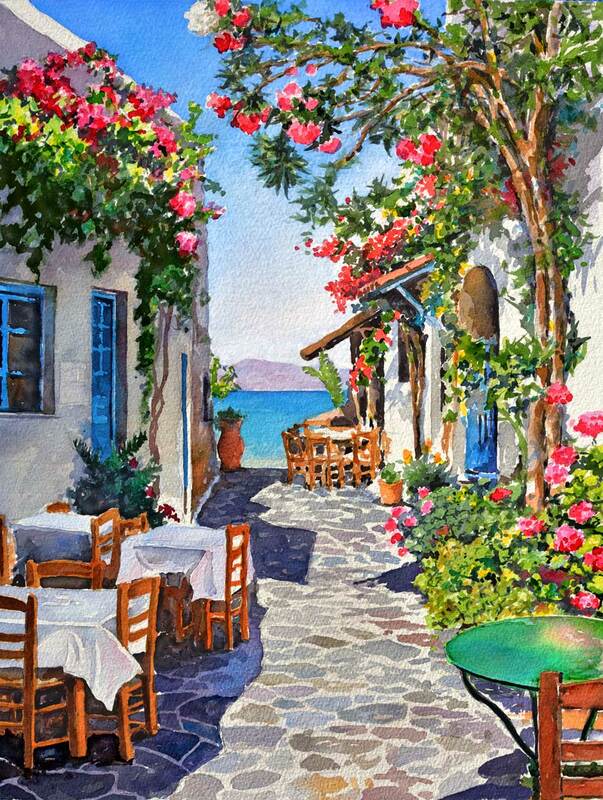 This restaurant offered traditional greek food. The speciality being ‘papoutsakia’ meaning little shoes, it consisted of a slice of squash covered by seasoned ground beef and topped by béchamel sauce. 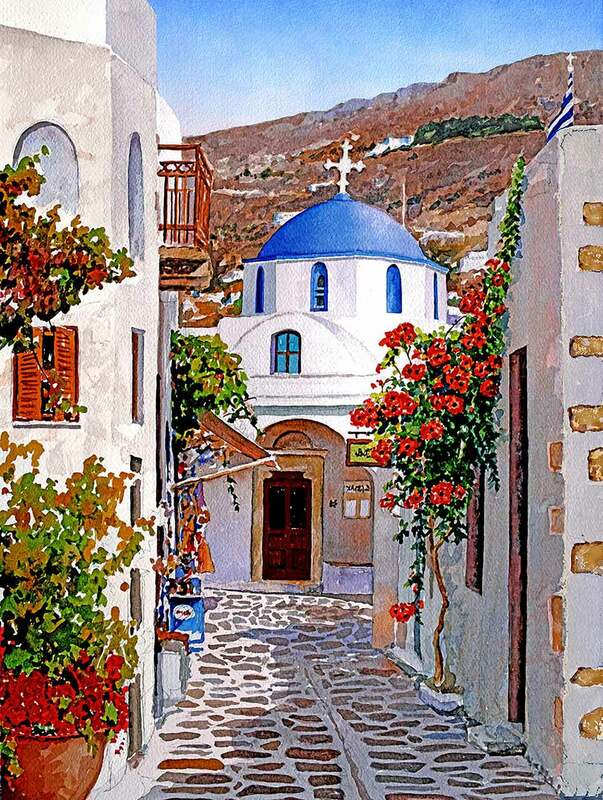 This beautiful little church is on the Island of Paros. It was built in the typical island style , probably by a small group of families that live close by. Interiors are small, decorated with icons and usually lit by candles. Ceremonies would usually be performed by a visiting priest. 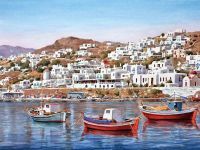 Patmos is the most northerly of the Dodecanese Islands. 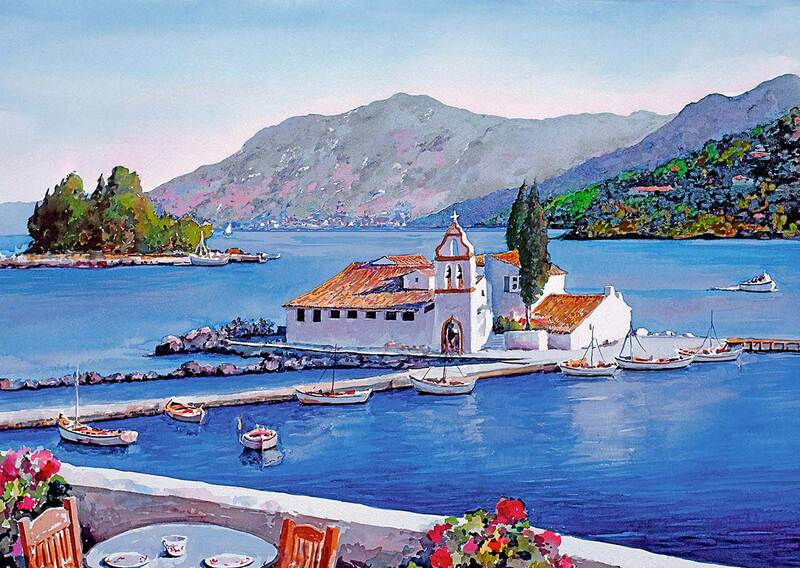 It is a beautiful island that has maintained it’s religious traditions and has many monasteries and churches. The book of Revelations was written on the island by John the Evangelist. An important monastery on the island honors his name. Residents take great pride in the island and many of the older houses have been restored. In 479 b.c. the Persian Fleet, following land victories at Thermopylae and Artemisium had been unexpectedly routed in a sea battle in the Straights of Salamis. Their king: Zerxes retreated back to Persia, but left 150,000 men to over winter and finish his quest to subjugate the fractured Greek States. 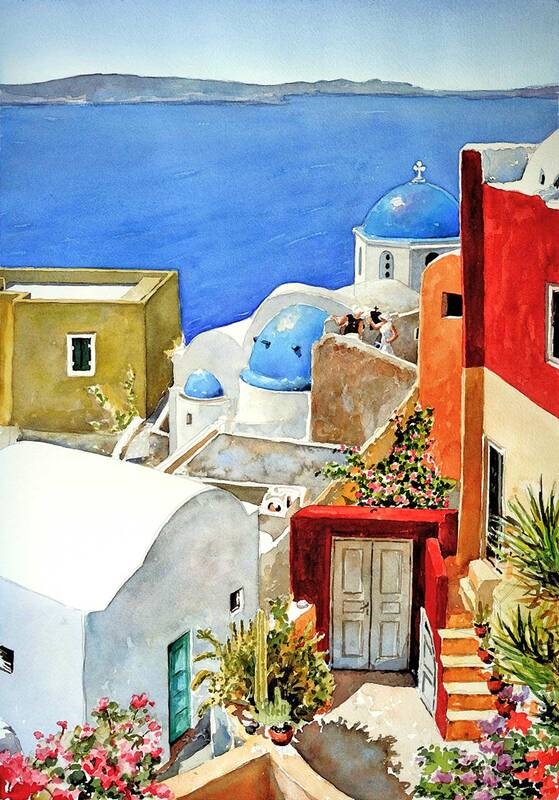 This beautiful view through an arched portal is of the sea filled caldera on the volcanic Island of Santorini. Many of the nearby restaurants have alfresco dining on garden terraces that offer similar spectacular views. Mother Mary of Poulati is built on a steep cliff on the Island of Sifnos. 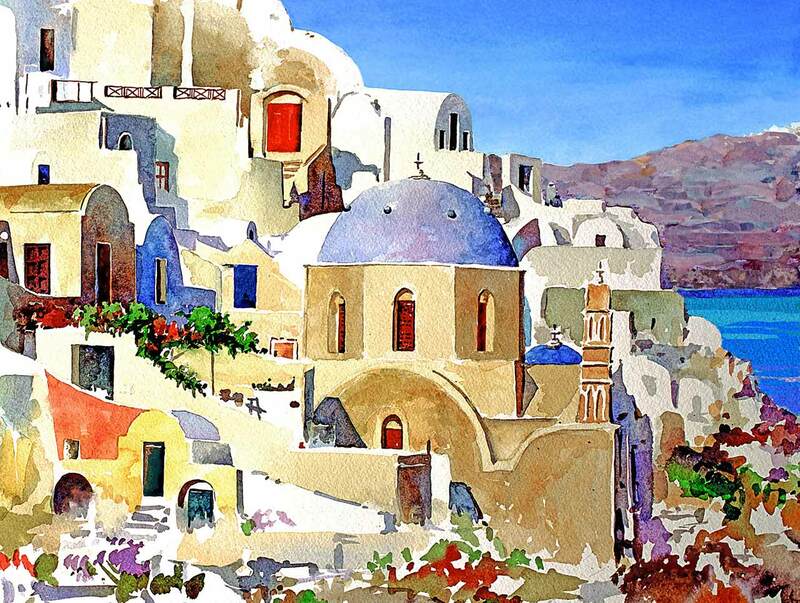 It has the traditional blue dome of family churches in the Cyclades Islands. Greece has many picturesque villages. 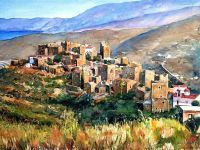 This one is in The Mani Region of The Peloponnese. 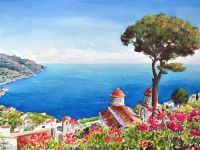 Prosilio means “towards the sun” and the striking church and the houses are built down the rocky slopes facing the sun. Goats graze on the rocky outcrops among groves of cultivated olive trees and wild prickly pear. 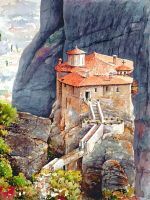 This church nestled in the steep rock houses the miraculous icon “Panagia Proussiotissa” which is much revered by locals for it’s powers. The church which dates from 1754 a.d. is the domed cross type and features a small crypt located on the west side that can be adjusted to be used as a side chapel. 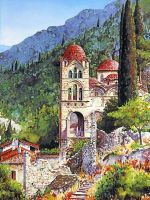 The monastery of which it is part is in the Evritania region of West Central Greece and is one of only a few that were saved in the region. 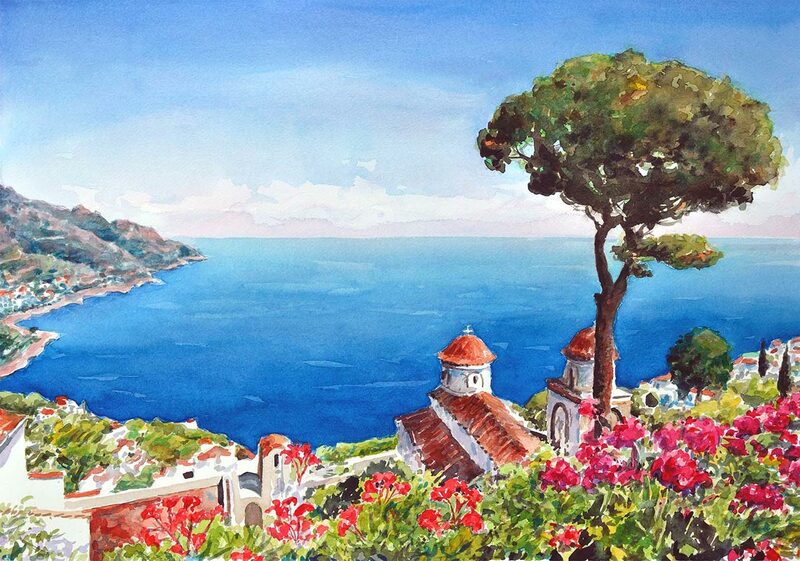 Ravello is a small town on The Amalfi Coast of Italy. 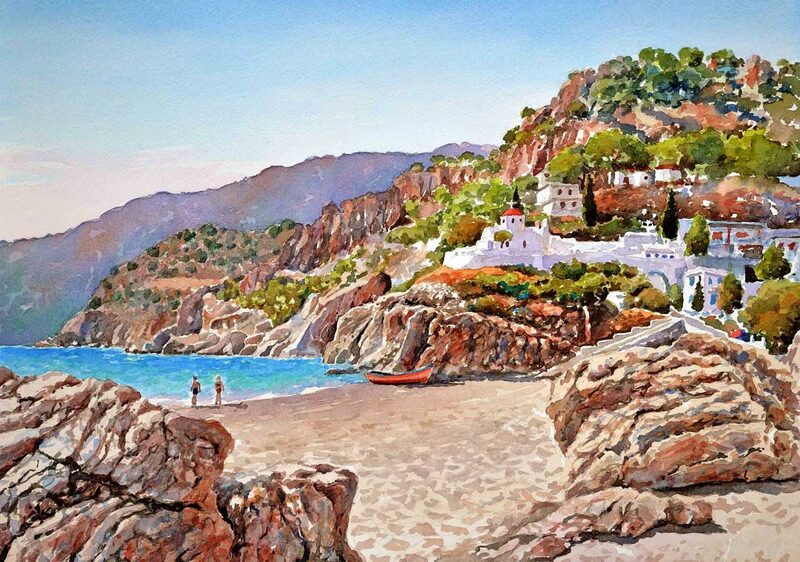 It’s steep wooded hillsides are studded with red roofed villas that offer spectacular views of the sparkling Mediterranean Sea below. 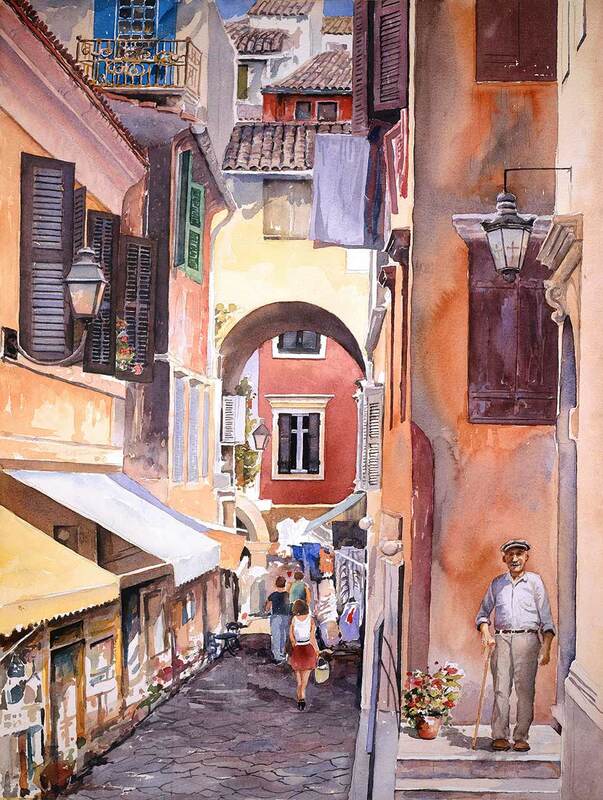 Historically the area had drawn artists, writers and musicians as well as tourists to enjoy it’s beauty and charm. 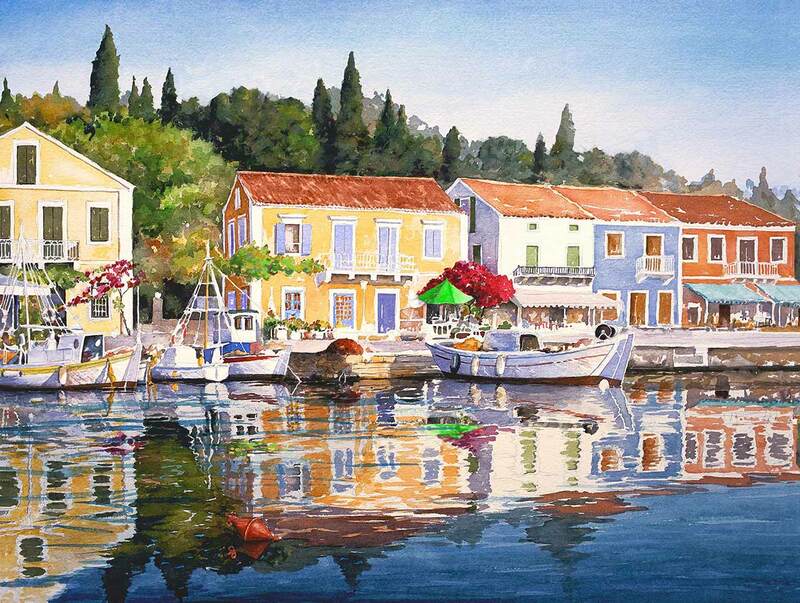 This tranquil harbor is located in Galaxithi, a beautiful old port town in Central Greece. The 18th and 19th centuries saw great prosperity for sailing ship owners in this town and during that time many fine mansions were built. Trade was later lost to steamships but the buildings remain as a reminder of past glory. Tourism is now a major source of the regions income. 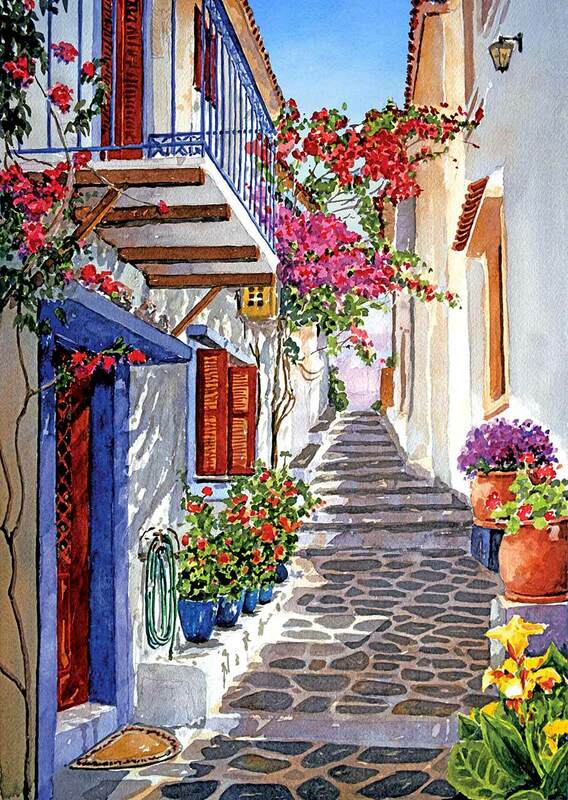 This colorful passage winds down to the harbor on the Island of Samos. 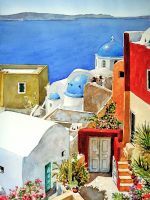 Located in The North Eastern Aegean, only a mile from The Anatolian Coast of Turkey, it is said to be one of the most beautiful Hellenic Islands. The fertile soil supports wine grapes, almonds, figs and citrus but most of it’s income comes from tourism. 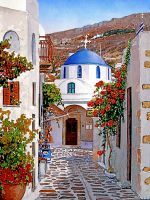 Small churches, supported by a few families are the norm on many Greek Islands. 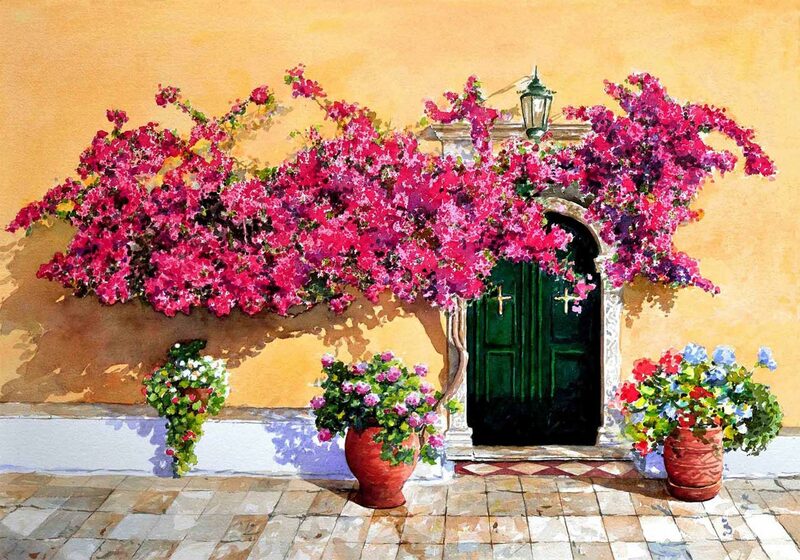 The doorway of this church, adorned by bougainvillea and potted plants is testament to the loving care that is given by the island people to their churches. Tall ceilings and heavy walls make this building a cool sanctuary in the summer heat. 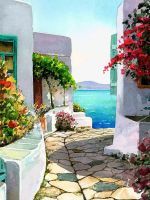 Greece has many islands and small passageways that wind their way down to the coast are common. 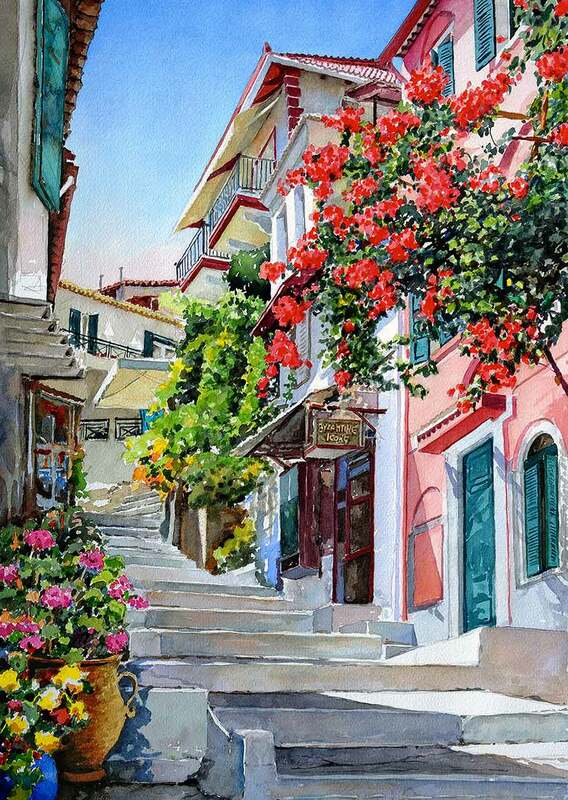 This one is in Skiathos, part of the Cyclades group of Islands. 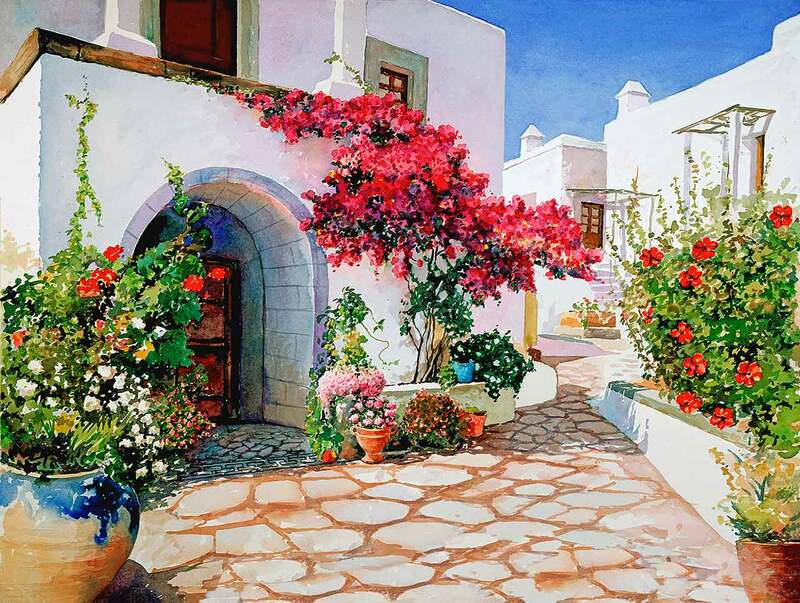 It is a very lush island with thick pine forests and streets abundant with summer flowers. 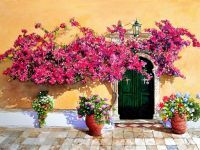 Bougainvillea, geraniums and sweet basil are favorites and are often seen growing in pots next to doorways. 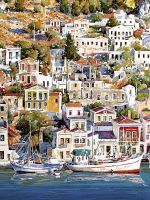 Spetse is one of the Sardonic Islands, a group that is close to Athens. Colorful boats line the harbor after a days fishing in the local waters. 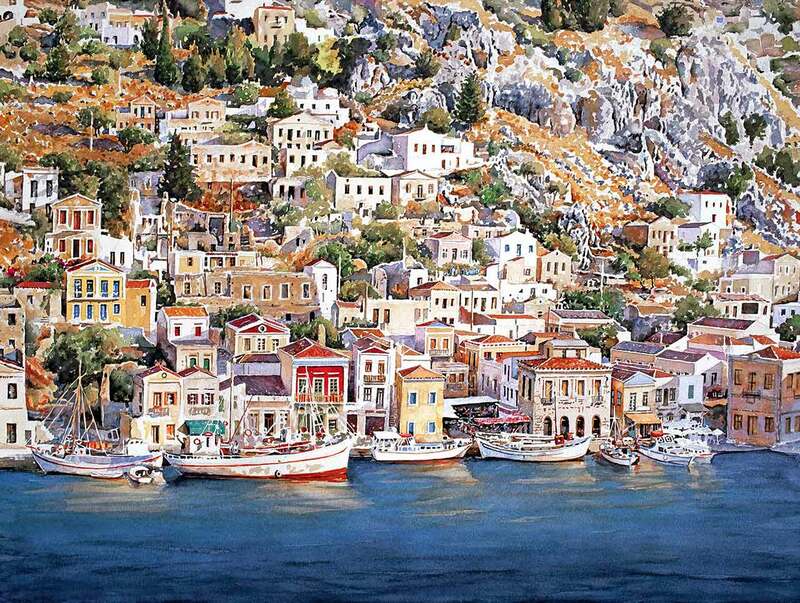 Spetse is one of the Sardonic Islands, a group that is close to Athens. Away from the busy harbor are fine beaches and cool pine forests. 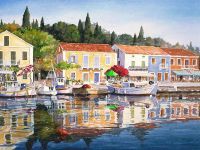 Spetse is a small island and is ideal for taking pleasant walks through the narrow streets where fine old villas and pretty gardens can be seen. 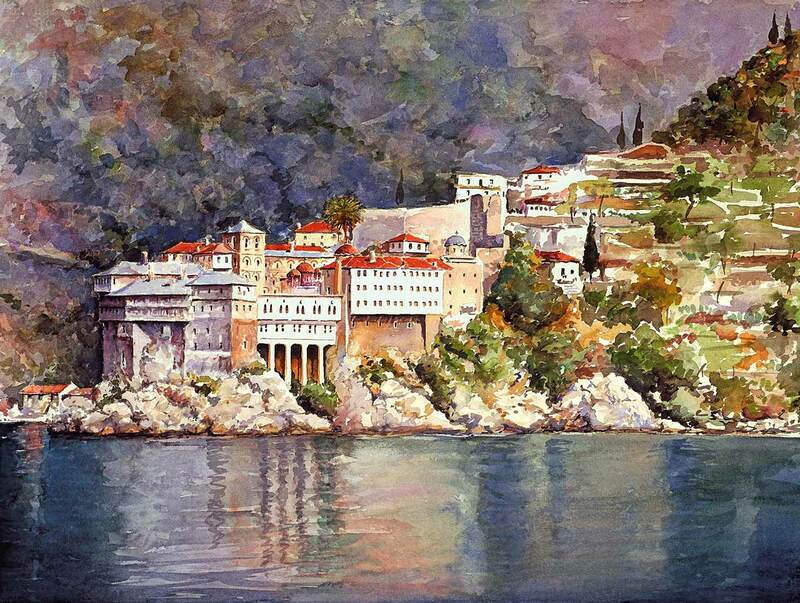 Mount Athos in Northern Greece is a peninsula which is home to many monasteries. 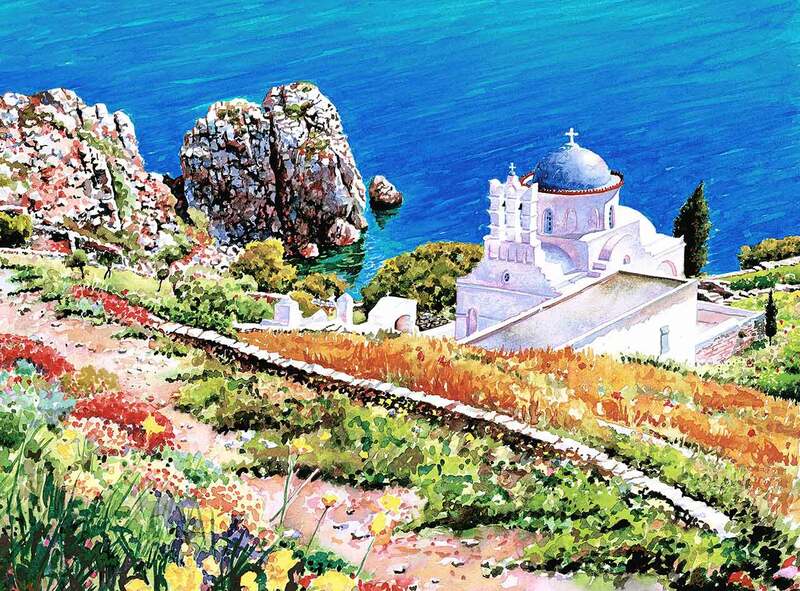 St. Gregory is built on the South West side by the sea and is one of the smaller monasteries on the peninsula. The monastery was founded in the 14th century and rebuilt after a fire in 1761 a.d. There are ten chapels and also living quarters for the seventy or so monks in residence. Visitors are welcome but access to the area is restricted to males only. Among the most important icons in the church is that of St. Nicholas. 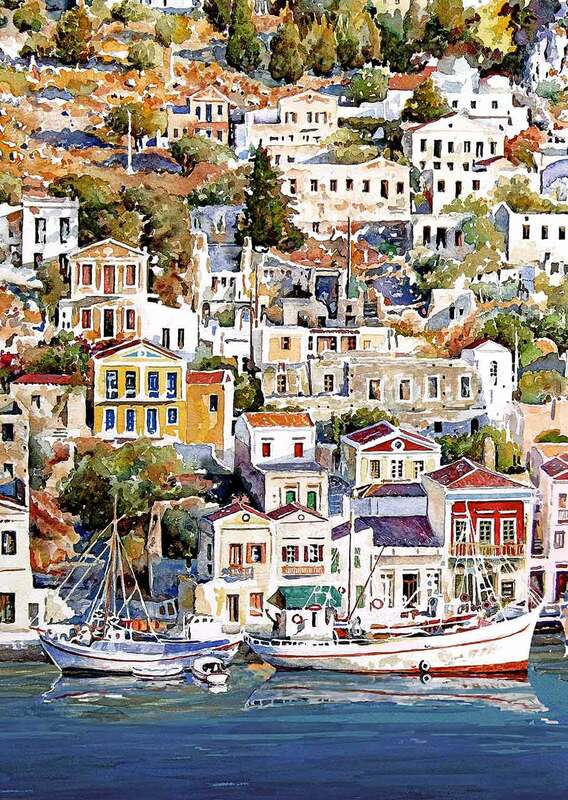 Symi is located in the South Eastern portion of Greece, close to Rhodes. Neo classical elegant buildings still dot the steep hillsides. They were built in the era of sailing ships. The area is also known for it’s sponge divers. The area has strict building codes to ensure the preservation of it’s historic beauty. 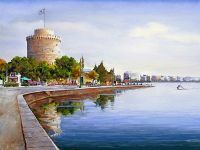 Thessalonika was founded in 315 b.c. and was named after the sister of Alexander the Great. 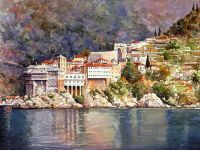 It is Greece’s second largest city and capital of the Macedonian region. 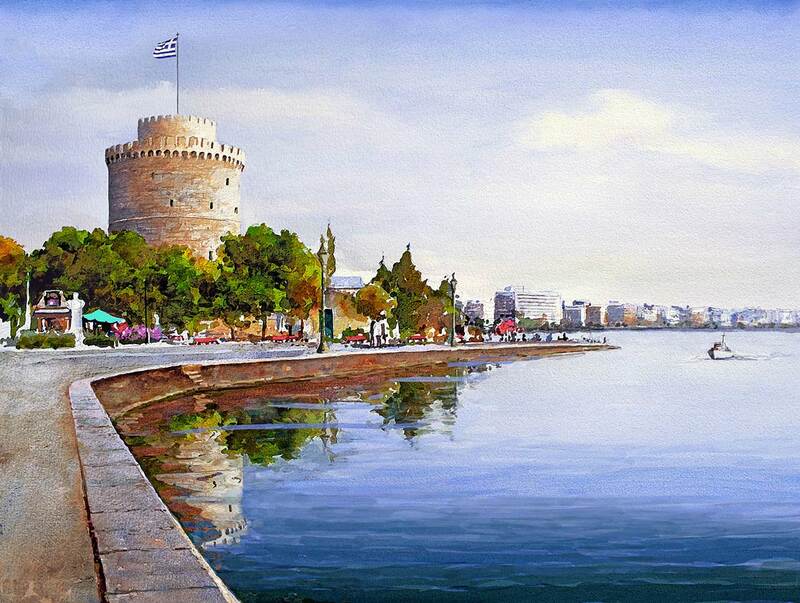 Many ancient and historic buildings still exist, including the White Tower, which is the most prominent feature of the harbor. This windmill provides a perfect place to enjoy the sun setting on the Greek Islands. It was built strategically on the bluff to harness the power of the coastal winds. Originally used to mill local grain, most mills have now been converted for business use or dwellings. Mills with their sails blowing in the wind are now rare. 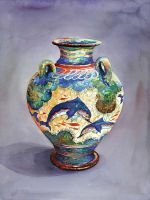 Colorful dolphins, coral and fish decorate this urn. 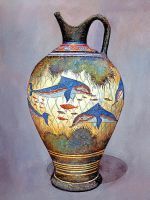 It is a style that was produced in Minoan times. 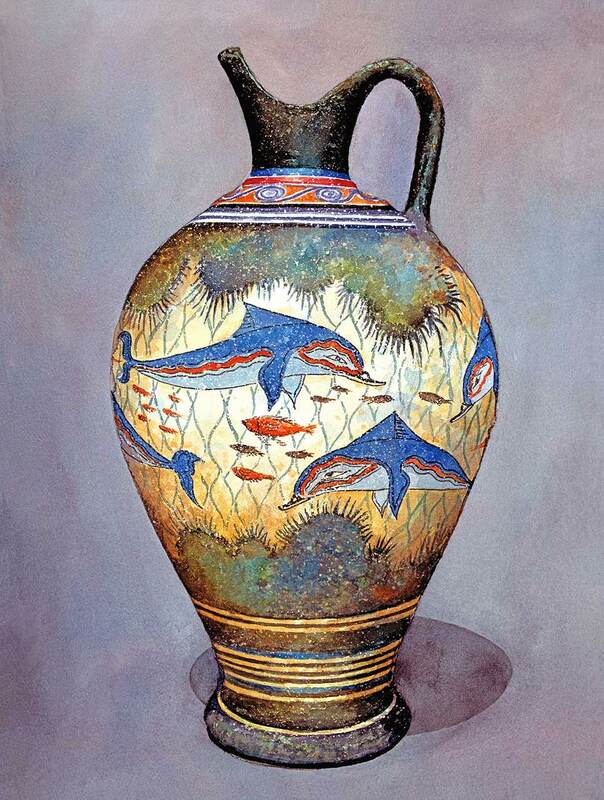 The original urns were probably produced around the area of Santorini and they were used for storage of staples like olive oil, wine and almonds. 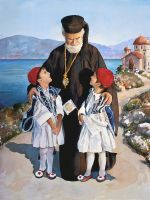 Two small boys welcome Metropolitan Alexios of Atlanta. 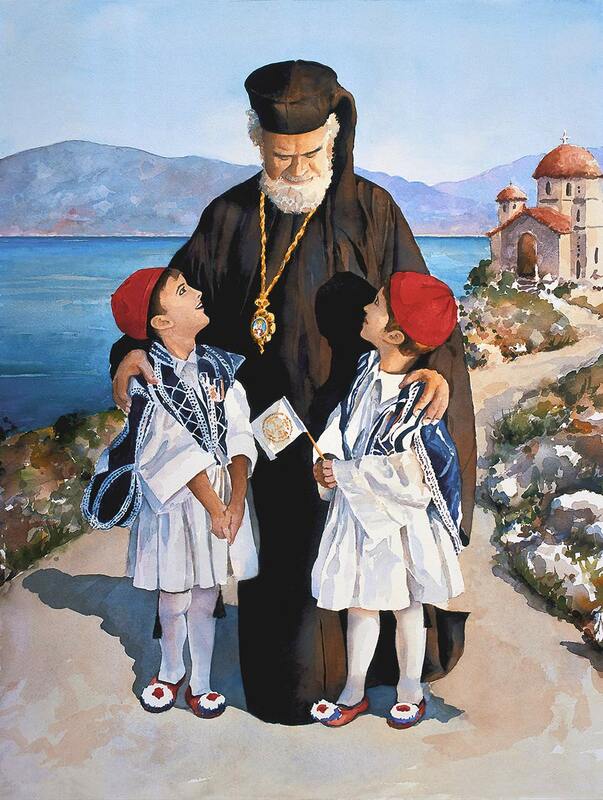 They are wearing the traditional costume of the Evzones; The Greek National Guard. 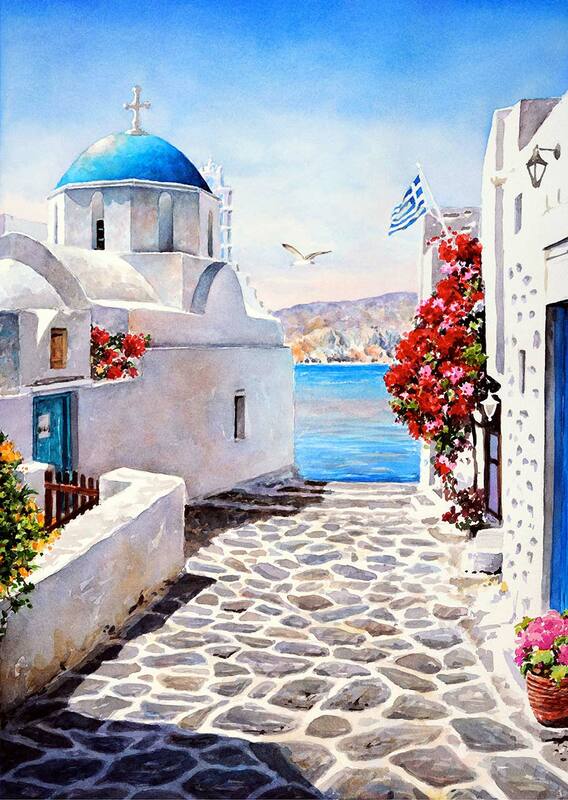 The background has been changed to depict a small monastery and seascape typical of Greece.